© 2002, © 2017 by Paul Freeman. Revised 9/21/17. before the Brouse apartment was added to the far (east) side. “In 1948, George Brouse was approached by a couple of friends about 2 farm fields next to each other that he owned. Would he be willing to have those fields turned into a landing strip? One of the friends, Harold Derk, owned an airplane & flew it as a hobby. He had often given his friend George a ride. He also had a heavy construction equipment business in Montandon, with road graders & power shovels. George Brouse agreed, and Derk used his equipment to lay out the runway & to level & seed it. Soon the 3,245' runway was complete. The first hangar at the Lewisburg Airport was built also in 1948, and it was large enough to shelter 5 aircraft. if Fred would take care of the airport on the weekends, George would build an apartment on to the end of the hangar for him & his new bride Ruth. 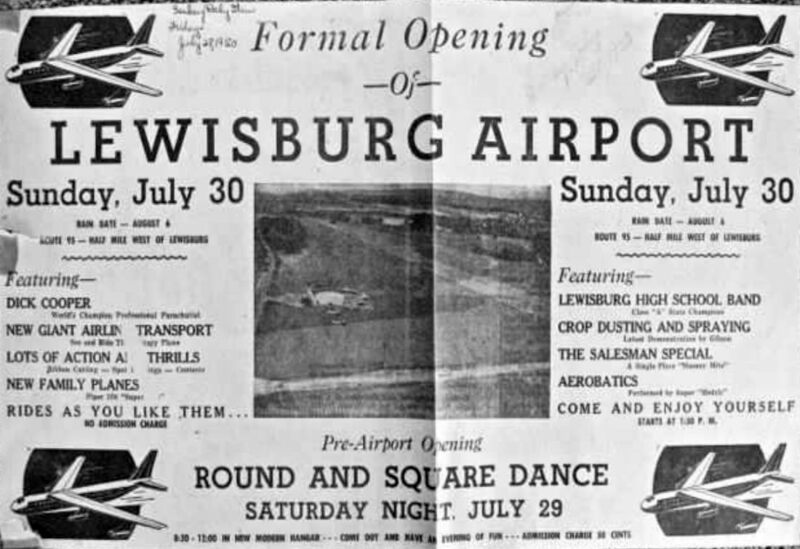 The announcement of the 7/30/50 Formal Opening of Lewisburg Airport (courtesy of Jeff Boehmer). which took up 18 passengers at a time on the Lewisburg Airport opening day celebration. Huffines continued, “And there it was, the Lewisburg Airport, so named by the township supervisors. It was inspected & licensed by the Civil Aeronautics Board. The Official Opening was 7/30/50. a cropdusting & spraying exhibition, and that evening in the hangar by round & square dancing. preparing to depart in a Piper PA-20 from Lewisburg to Sioux City, ND. Huffines continued, “Fred continued to farm, and George Brouse started a land development & construction company. Later a second hangar was built to the west. It was 60’ square & taller than the first hangar with its 18’ ceiling. Jess Hackenberg used this hangar, as did Joseph Lahout. Both were mechanics. The hangar had special overhead doors. and included sales, service, air taxi service, charter flights, and instruction. Marlyn 'Barney' Aikey was hired as the first Chief Instructor & Business Manager at the Lewisburg Airport. Later the job was taken over by Dallas Hanlon. i.e., going for rides, often to take aerial photographs or merely to look out over the countryside. Jay Mathias of JPM Industries flew products to New York & Philadelphia out of the Lewisburg Airport. Huffines continued, “Gassing up the aircraft was not without its dangers. The gas was stored in 55-gallon drums. The gas was then pumped from the drum into the aircraft, which had to be grounded to avoid any sparks. In that early time, a solo flight of one-half hour duration cost $3.30. The instructor cost another $5.50. 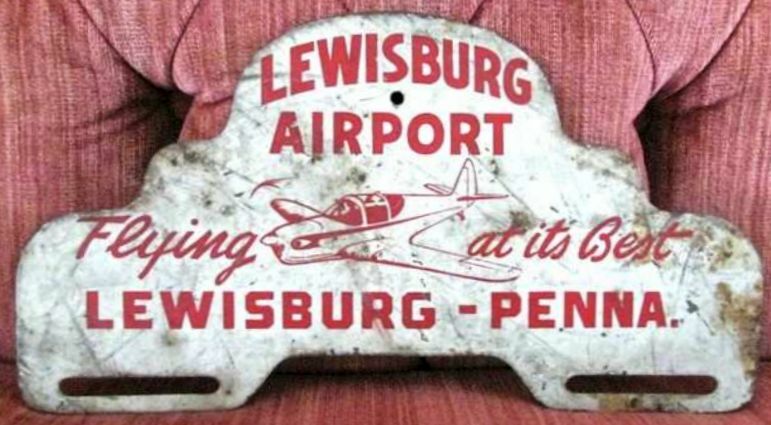 An undated license plate sign promoting the Lewisburg Airport (courtesy of Jeff Boehmer). 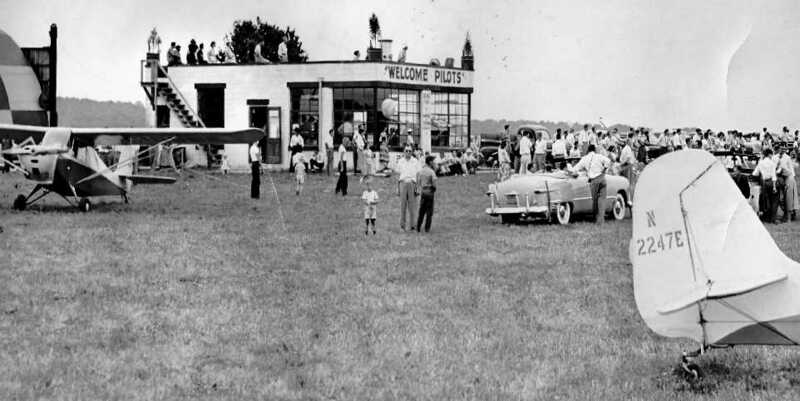 A 1952 photo showed 10 single-engine aircraft at a fly-in at the Lewisburg Airport (courtesy of Melvin Reed). Huffines continued, “The Brouses eventually owned 5 aircraft. Several other people used the runway, including, Lester Reed, Dallas Hanlon, Warren Elze, Frank Hinish, Fred Kessler, and Dan Henry. Frank Hinish, owner of Prowant’s Men’s Clothing store on Market Street in Lewisburg, would often relax by flying his plane during his lunch hour. Reed liked to do stunts & loops with the aircraft. Huffines continued, “Fred’s grandmother, Agnes Brouse, at aged 72 took her first airplane ride from the Lewisburg Airport. Her pilot was Joseph Diblin, who flew a Piper Super Cruiser PA-12, which held 3 passengers. Fred reported that Grandma enjoyed the ride. Fred Brouse once flew to Hiawatha, Kansas, using a radio beam, and during the flight almost fell asleep. He ended up 50 miles from where he was supposed to be. His friend Harold Derk certainly never let him forget that flight. 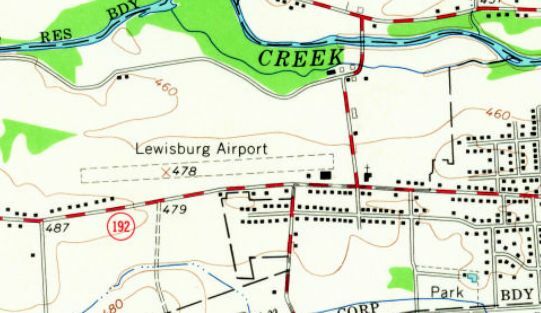 Lewisburg Airport, as depicted on the 1957 USGS topo map. 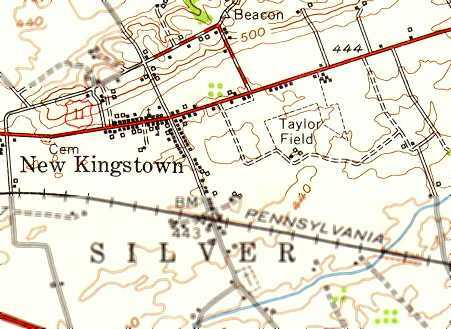 The 1958 NY Sectional Chart depicted Lewisburg Airport as having a 3,200' unpaved runway. 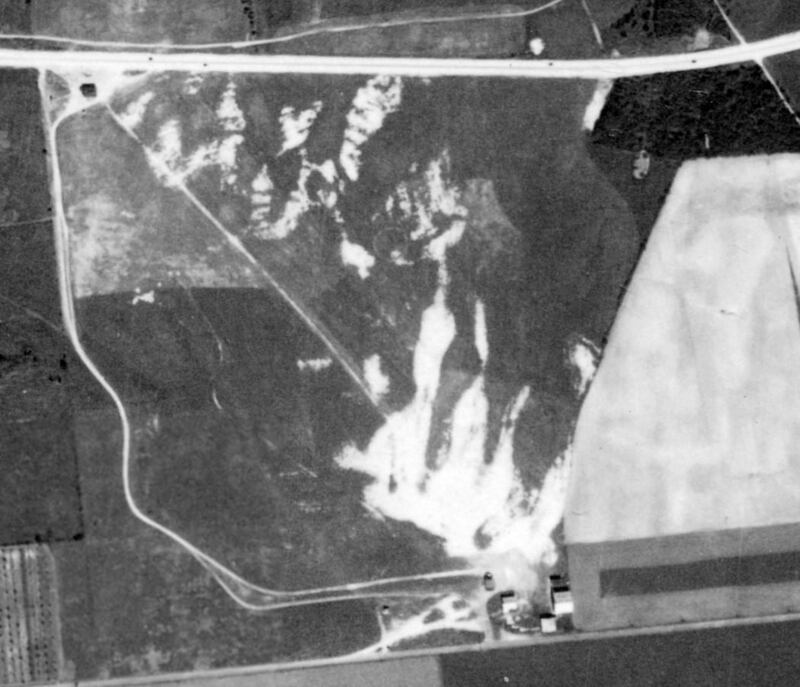 The earliest aerial photo which has been located of Lewisburg Airport was a 7/3/59 aerial view (from Penn Pilot). 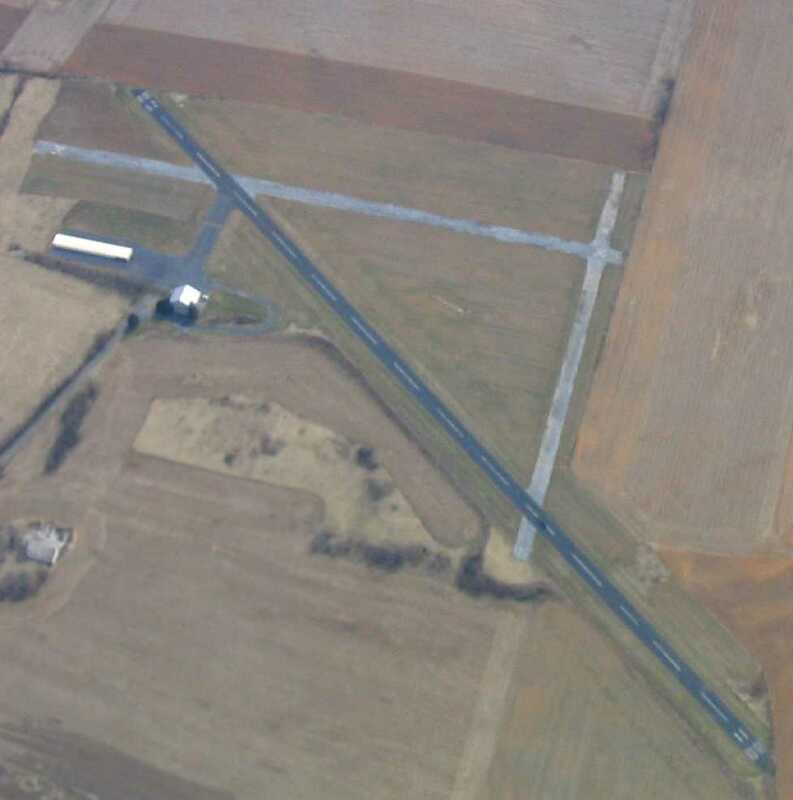 It depicted Lewisburg Airport as having an east/west grass runway, with a single hangar on the southeast side. A mid-1960s photo (Courtesy of Melvin Reed) of an unusual visitor to Lewisburg Airport: a Grumman G44 Widgeon amphibian. It was parked at the back of Hangar #1, next to the office. The Brouse apartment was visible as the 2nd story. which towed the “HAPPY BIRTHDAY JIMMY HOFFA” banner over the penitentiary. It was parked at the back of Hangar #2. A 1964 photo (courtesy of Melvin Reed) of Governor William Scranton arriving at the Lewisburg Airport in a Beechcraft H-18. A 1964 photo (courtesy of Melvin Reed) of a Beechcraft T-34 Navy trainer at Lewisburg Airport. In the background is the east end of Hangar #1, showing the Brouse apartment upstairs with a balcony & the airport office on the ground floor. with 2 small buildings on the southeast side. 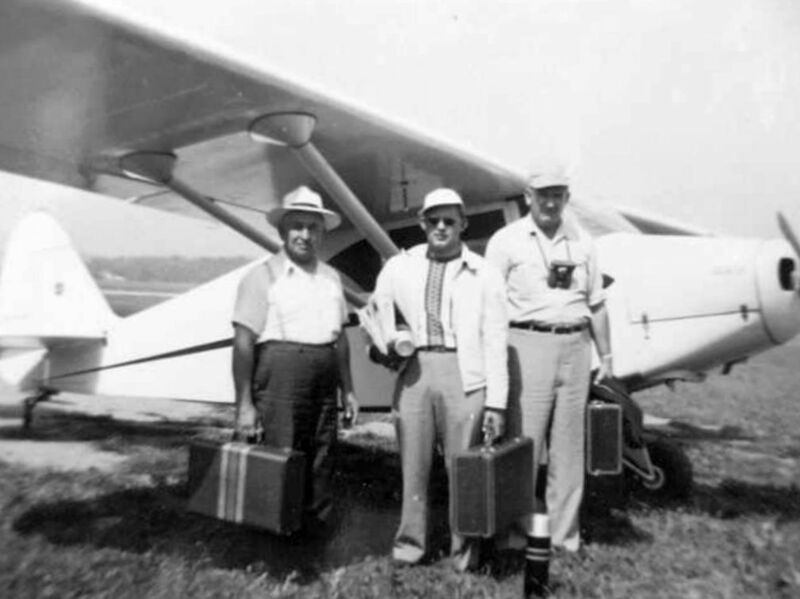 Huffines continued, “Joseph Lahout, a self-employed pilot, operated Lahout Air Services from the Lewisburg Airport through the 1960s. He owned a 1959 Piper Tri-Pacer aircraft, and he purchased & restored a World War II Aeronca Defender Observation airplane. He used these 2 airplanes to begin his career as a flight instructor & continued to train young pilots well into his retirement. a photograph shows a sign announcing a fly-in breakfast at the Lewisburg Airport, sponsored by the Civil Air Patrol. At airshows & similar events, flyers would gather socially & show off their aircraft to each other & spectators. Bill Piper, president of Piper Aircraft, was an occasional visitor. Dallas Hanlon flew the director of the award-winning Riley Raiders to & from Lewisburg for the annual Cavalcade of Bands at the Bucknell University stadium. It is clear that the airport was busy during the years of its existence, and it served a need in the community. 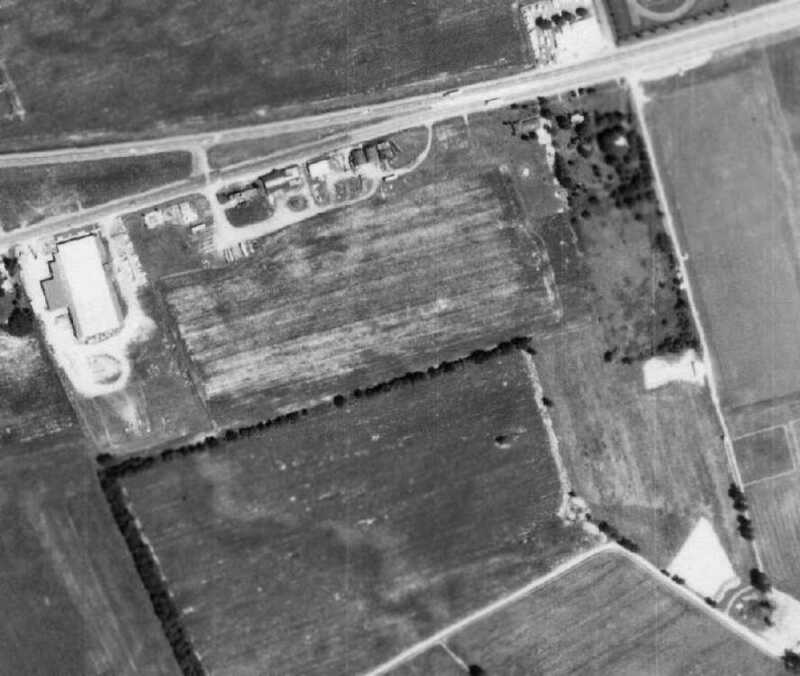 The last photo which has been located showing the Lewisburg Airport in operation was a 7/10/70 aerial view (from Penn Pilot). It depicted 5 single-engine aircraft parked around the hangar. 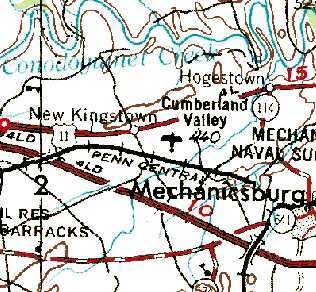 Huffines continued, “The Penn Valley Airport at Selinsgrove directly affected the operation & existence of the Lewisburg Airport. Federal funds became available for the development of airports in smaller communities. Lewisburg was not eligible for these funds because the airport was privately owned. The commissioners, who would have normally supported the case for the Lewisburg Airport, threw their support to Selinsgrove. The Selinsgrove Airport received the funding, which ultimately resulted in bringing the operations at the Lewisburg Airport to an end. 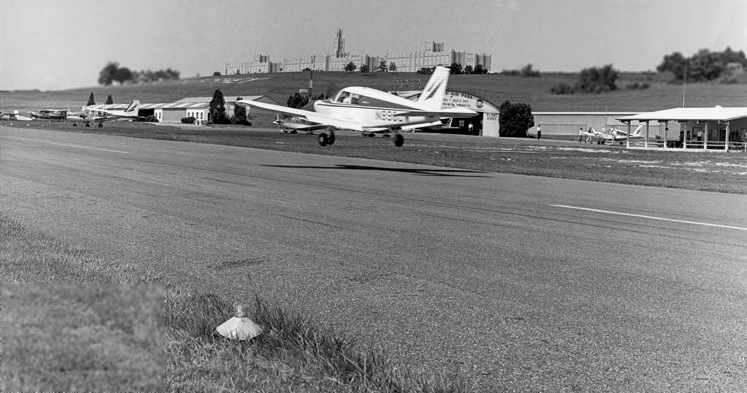 The Lewisburg Airport did not have a cement runway, and that limited its revenue. By 1975, Brouse Enterprises, heirs to the George Brouse estate, made the decision to close the airport. The Lewisburg Airport had operated for about 25 years. 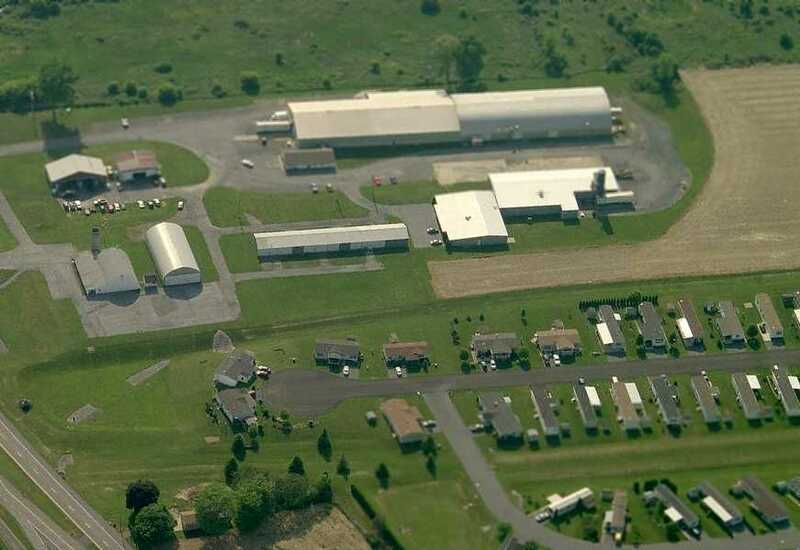 In 1979, Brouse Enterprises sold 1 acre of runway land to the Northumberland County Industrial Development Authority, which sold it to D & R Realty. 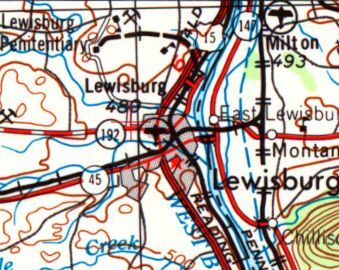 The 1983 USGS topo map continued to depict the “Landing Strip” at Lewisburg, even though the airport had been closed for 8 years. 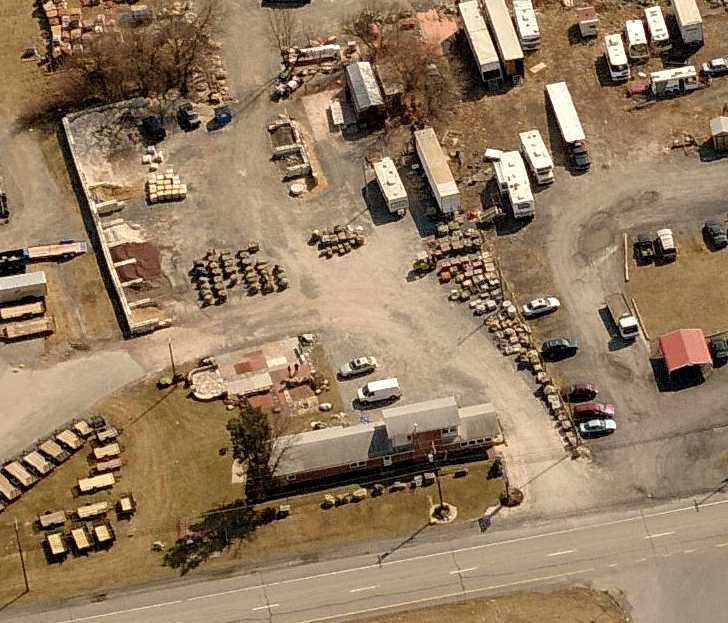 Huffines continued, “In 1987, Brouse Enterprises sold 2 acres to the Mifflinburg Bank & Trust Company, and its Lewisburg branch now occupies that site. In 1988, Brouse Enterprises sold land to the Buffalo Valley Telephone Company. Later in 1988, the Telephone Company sold 7 acres to St. John’s United Church of Christ, and its church building now sits on that site. Keiser’s Plumbing & Heating & Keiser’s Sporting Good (called Out ‘N’ About) rented half of Hangar #1 when it no longer housed aircraft. but the majority of the runway remained intact, along with Hangar #1. 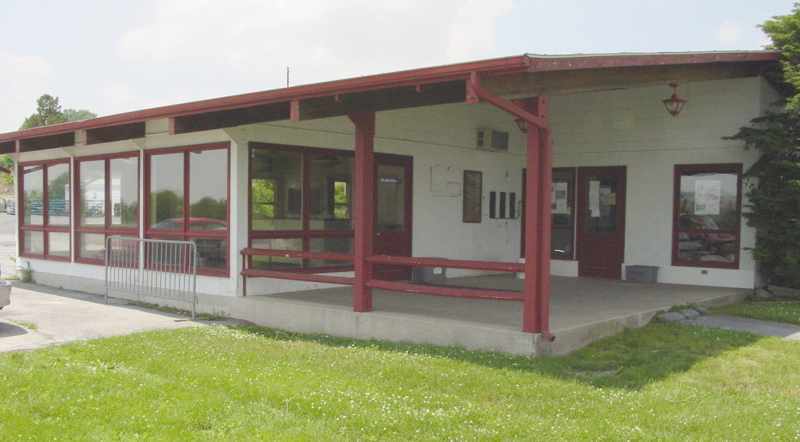 A view of Lewisburg Airport Hangar #1 shortly before it was razed in 2003. The Buffalo Valley Telephone Company sold 56 acres to Dale & Joan Miller, owners of Playworld Systems. 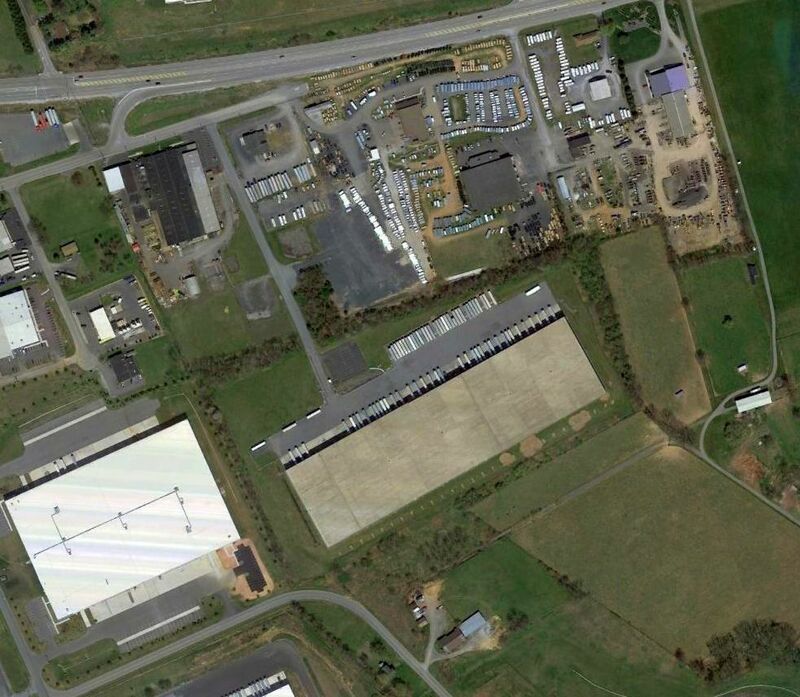 A 2005 aerial photo showed that a large industrial building for Playworld Systems had been built over the center of the Lewisburg Airport property. Huffines continued, “Dale Miller had promised not to cut down the stand of oak trees in front of the Playworld building. The oaks were called Brouse’s Grove, where the Brouse family would hold picnics & family reunions. 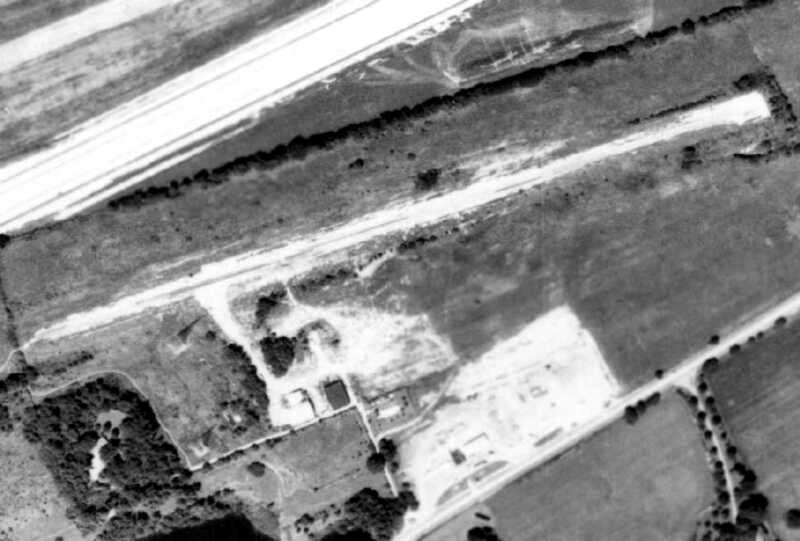 A 2013 aerial view showed no trace remaining of Lewisburg Airport. 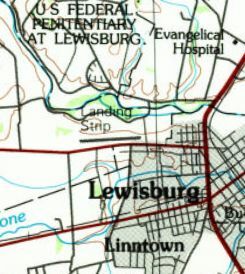 The site of Lewisburg Airport is located northwest of the intersection of Buffalo Road & Airport Road, appropriately enough. Thanks to Jeff Boehmer for pointing out this airfield. 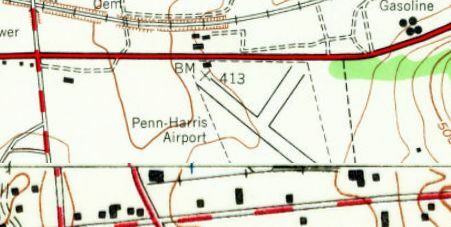 Penn-Harris Airport, as depicted on the 1935 Regional Aeronautical Chart. 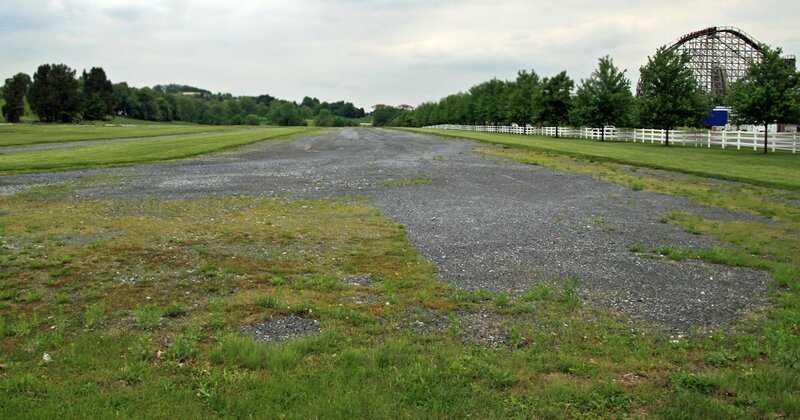 This early general aviation airport was located southeast of downtown Harrisburg. The date of establishment of Penn-Harris Airport has not been determined. 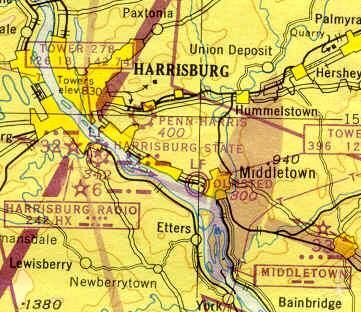 The earliest depiction which has been located of Penn-Harris Airport was on the 1935 Regional Aeronautical Chart. in his Packard Bellanca Pacemaker monoplane NR782W, with which he set a nonstop non-refueling endurance record of 84.5 hours in 1931.
with an airport circle marking in the center, and some buildings (hangars?) at either runway end. An undated (circa 1930s?) aerial photo from a postcard (courtesy of Jim Fainelli) depicted several buildings, hangars, and 3 biplanes at Penn-Harris Airport. 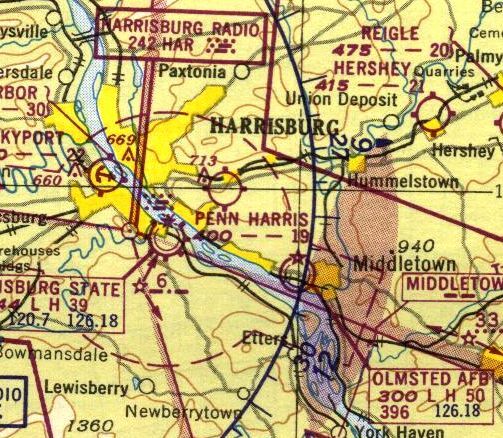 Penn-Harris Airport was not depicted at all on the 1943 USGS topo map. like many other small civilian airports due to wartime restrictions on general aviation airports near the coasts. A circa 1943-45 aerial view looking north at Penn-Harris Airport from the 1945 AAF Airfield Directory (courtesy of Scott Murdock). as an 78 acre square-shaped property having an 1,800' all-way sod landing area. The 1945 NY Sectional Chart depicted Penn-Harris Airport as a commercial/municipal airport. 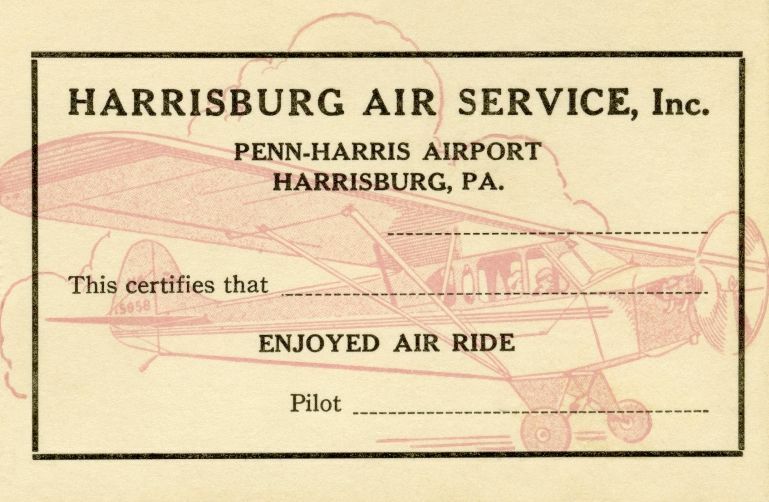 An undated “Air Ride” certificate from Penn-Harris Airport's Harrisburg Air Service Inc. 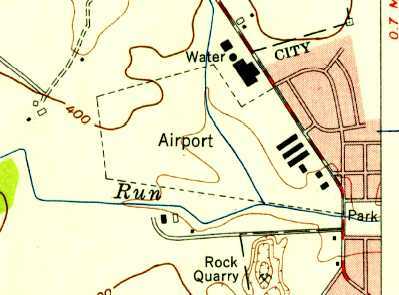 The 1947 USGS topo map depicted Penn-Harris Airport as having 2 runways, with a small building on the northwest side. 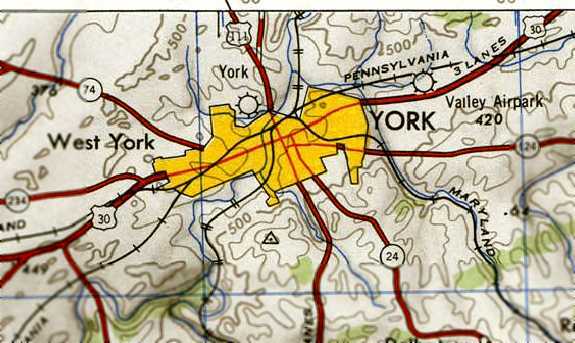 The last depiction which has been located of Penn-Harris Airport was on the 1950 NY Sectional Chart. It depicted Penn-Harris Airport as having a 1,900' runway. as it was no longer depicted on the 1956 USGS topo map. 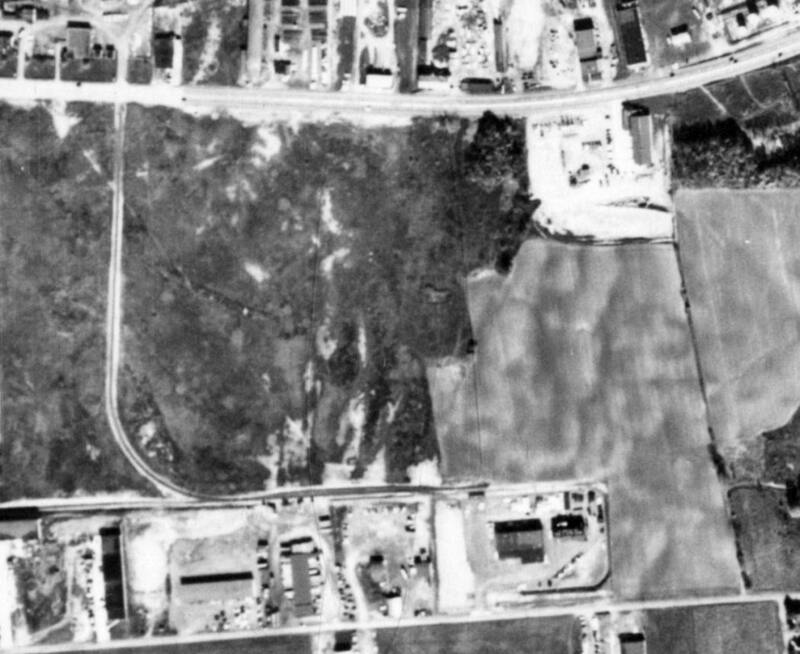 A 10/25/56 aerial view (from Penn Pilot) showed a few buildings possibly remained on the south side of the site of Penn-Harris Airport. 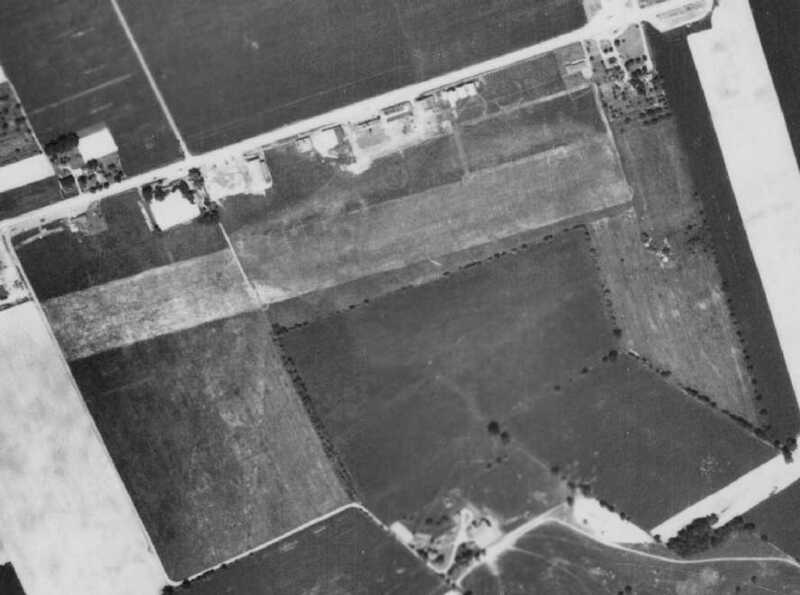 A 1961 aerial photo showed no trace of Penn-Harris Airport, with the site just an empty field. 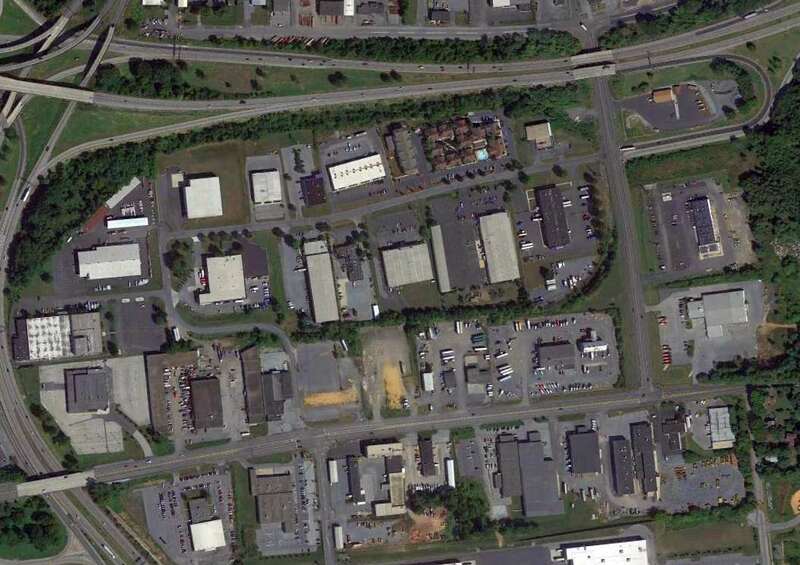 A 2013 aerial view showed no trace of Penn-Harris Airport. The site of Penn-Harris Airport is located southeast of the intersection of Route 322 & Interstate 83. Thanks to Jeff Hays for pointing out this airfield. A 9/15/37 aerial view (from Penn Pilot) appeared to depict a single northeast/southwest grass runway. 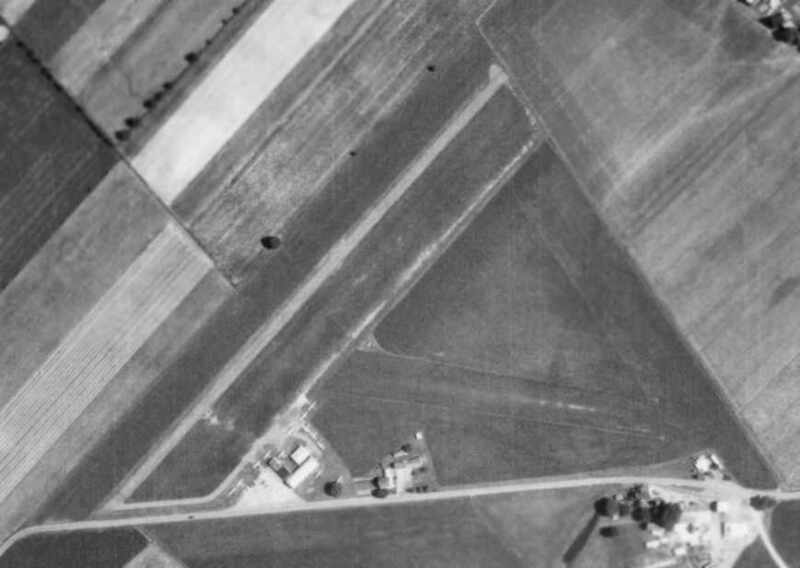 The date of establishment of this small country airfield has not been determined. 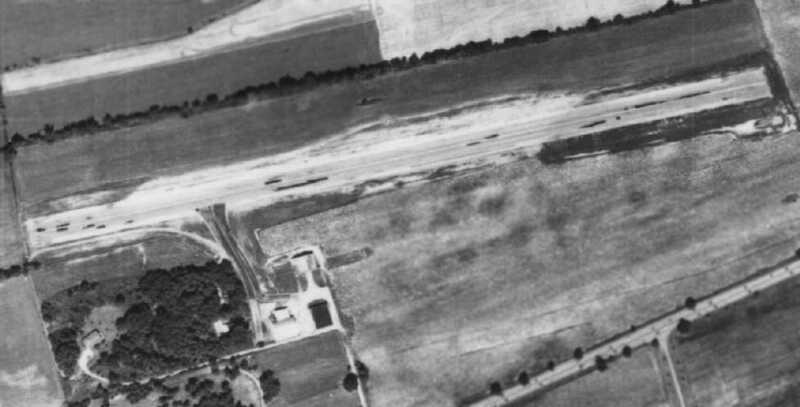 The earliest depiction which has been located of Crumling Airfield was a 9/15/37 aerial view (from Penn Pilot). It appeared to depict a single northeast/southwest grass runway. along with several buildings (hangars?) on the southeast side which had been added at some point between 1937-57. 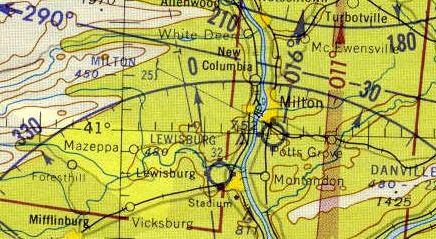 Crumling Airfield was not depicted at all on the 1964 USGS topo map. but the field appeared deteriorated & there was no indication of recent usage. 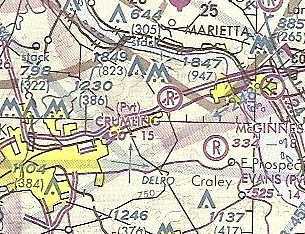 The earliest aeronautical chart depiction which has been located of Crumling Airfield was on the March 1977 Washington Sectional Chart. It depicted Crumling as a public-use airfield with a 1,500' unpaved runway. as the 4/6/92 USGS aerial photo showed that the runway had been covered with several industrial buildings. 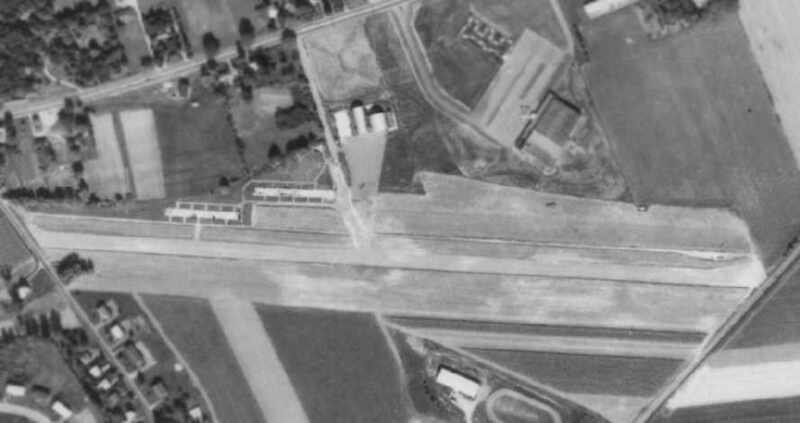 even though the aerial photo from the previous year showed buildings covering the former runway. The field was continued to be depicted as having a 1,500' unpaved runway. 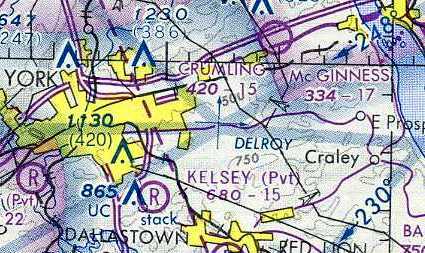 Crumling Airfield was no longer depicted on the 1995 Washington Sectional Chart. 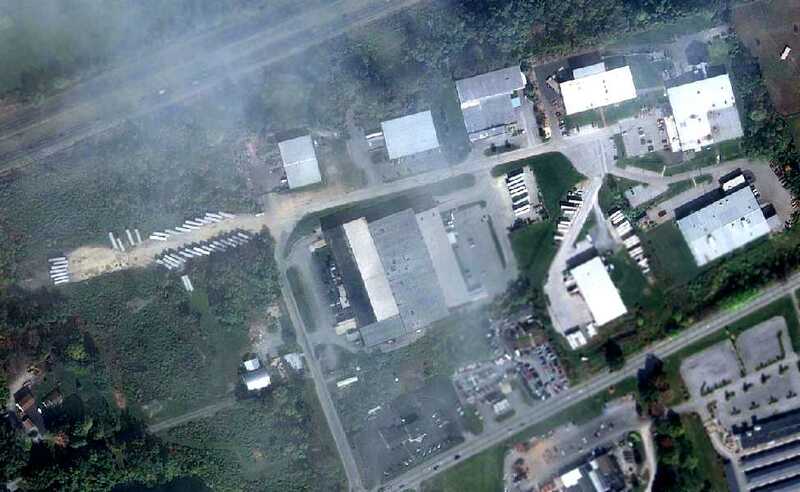 A 10/24/10 aerial view showed industrial buildings lining the former Crumling runway. 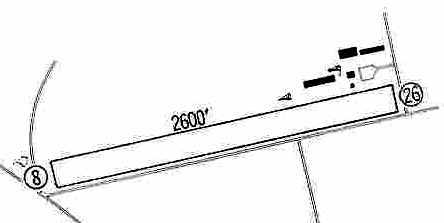 The site of Crumling Airfield is located north of the intersection of Commerce Way & Run Way, appropriately enough. Thanks to Andrew Stone for pointing out this airfield. Millard Airport, as seen on the 1950 NY Sectional Chart (courtesy of Mike Keefe). The earliest depiction which has been located of Millard Airport was on the 1950 NY Sectional Chart (courtesy of Mike Keefe). It depicted Millard as having a mere 1,900' paved runway. 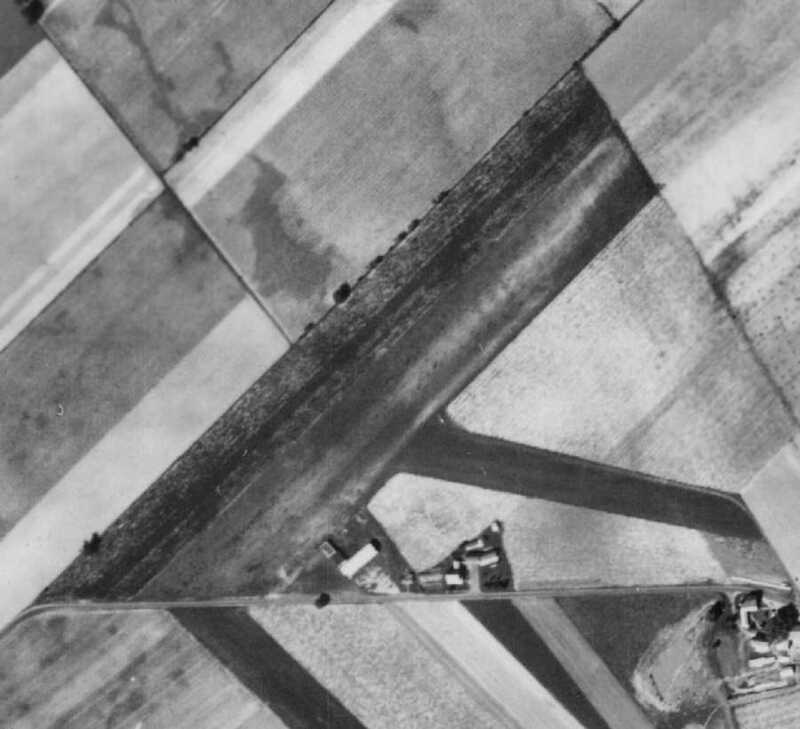 The earliest photo which has been located of Millard Airport was a 1951 aerial view. and a paved ramp with 2 hangars on the northeast side. 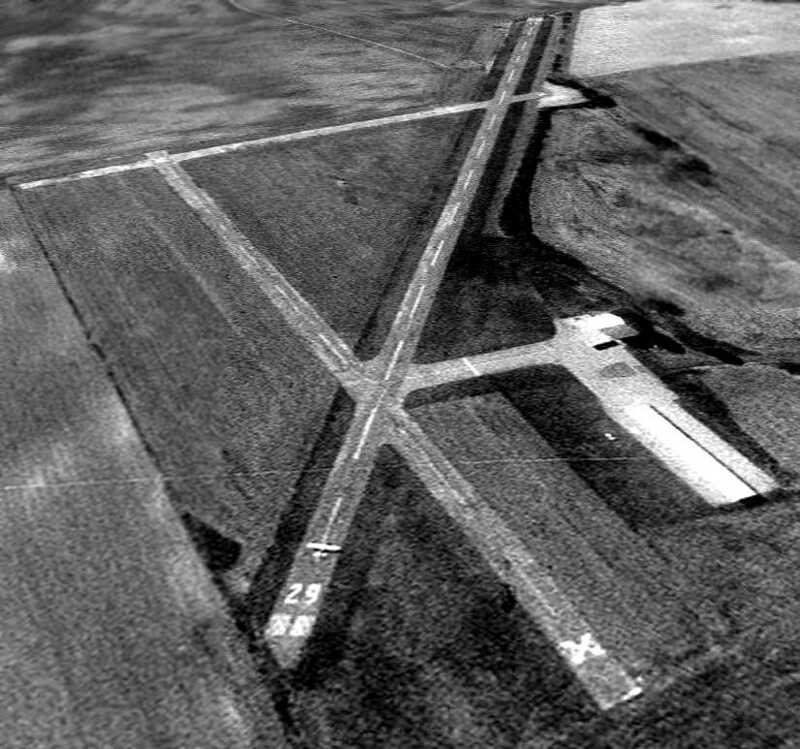 The earliest photo which is available of Millard Airport was a 10/25/56 aerial view (from Penn Pilot). It depicted Millard in the same configuration as the 1951 photo. The 1956 USGS topo map depicted Millard Airport as having 3 paved runways, with a ramp & a single building on the northeast side. 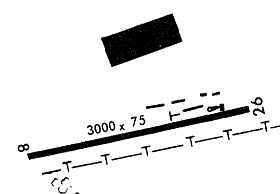 The 1958 NY Sectional Chart depicted Millard as having a 3,100' paved runway. A 7/7/70 aerial view (from Penn Pilot) depicted 3 single-engine aircraft at Millard Airport. 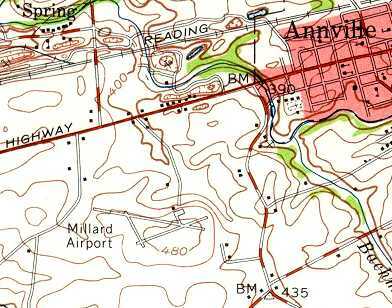 The 1983 PA Airport Directory depicted Millard Airport as having 3 bituminous runways, with the 2,850' Runway 11/29 as the longest. A hangar, office, and T-hangars were depicted on the northeast side. It depicted Millard as having 2 paved runways, with the longest being 2,800'. A 4/8/93 aerial view depicted 2 single-engine aircraft at Millard Airport. A 1994 airport directory depicted Millard as having 3 paved runways, with the 2,870' Runway 11/29 as the longest. which showed a single-engine aircraft just beyond the Runway 29 numbers. Paul Freeman flew into Millard Airport in January 2001, to find the airport having no fuel, and no one home. The last airport directory listing which has been located of Millard Airport was in the 2005 PA Airport Directory (courtesy of John Clifford). The directory described Millard as having a 2,870' asphalt Runway 11/29. The undated aerial photo showed the other 2 runways remained intact but were closed. The manager was listed as L.A. Campbell. A March 2005 aerial view by Paul Freeman looking southeast at Millard Airport. A circa 2005-2010 aerial view looking north at the 2 hangars at Millard Airport, one of which is marked with “Millard Airport”. George Wolf recalled of Millard Airport, “I flew into the airport just once, in mid-July 2006, finishing up my private ticket. My instructor pulled the power & I executed a simulated engine-out landing to a full stop. I recall the runway being very rough, with many small rocks & cinders from the broken-up pavement. At the time, I was more concerned about the rock nicks to the prop on the 172 I owned, or the nosegear hitting a pothole & folding under. but there was an old rusted T-hangar building on the premises that could have housed a of couple aircraft. Matthew Loser reported in 2007, “Millard only has one usable runway any more from what I can tell. I was at the airport about a year ago & 2 of the runways are pretty much in complete disrepair & most likely unusable. I know it was owned by the Millard family, which also owned a number of limestone quarries in the area. The old Millard quarry headquarters is still in existence just to the north of the airport along Route 422. I don't know if the airport was put there primarily for business use or for pleasure. I do know that the family was the richest in the area, so I don't think the cost was an issue. I was told the airport was owned by a company in Reading, PA. 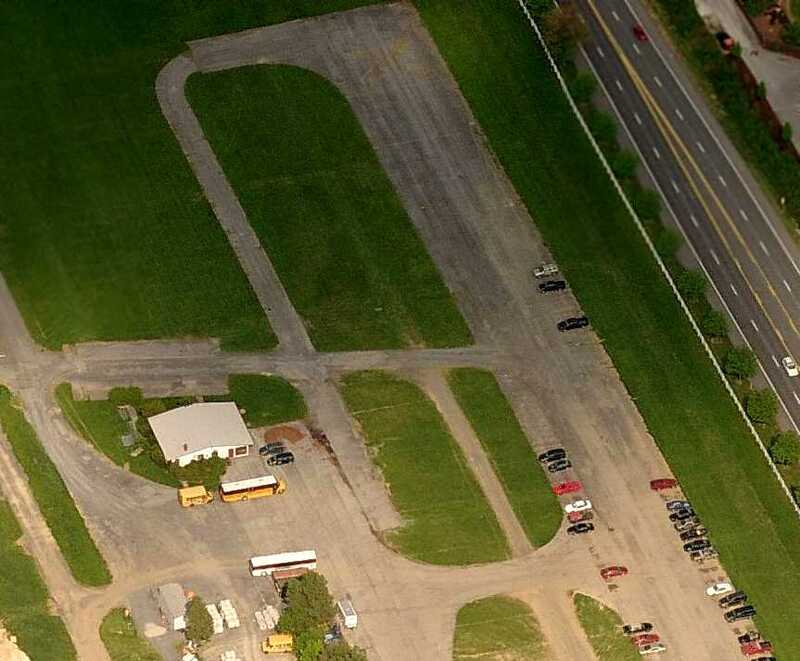 While still an active airport, Millard Airport's FAA Airport/Facility Directory data described the field as having a single 2,870' asphalt Runway 11/29. The owner was listed as MFS Inc., and the manager listed as L.A. Campbell. The field was said to be home to 6 aircraft. 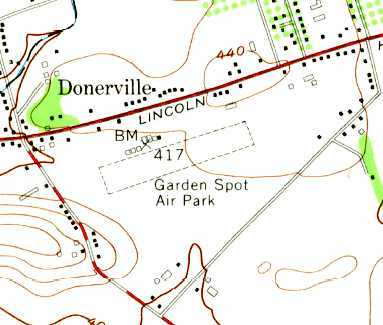 as it was depicted on the 2011 Sectional Chart as an abandoned airfield. showing the field to remain completely intact. Millard Airport is located southwest of the intersection of West Main Street & Mt. Pleasant Road. Taylor Field, as seen in a 1937 aerial view. 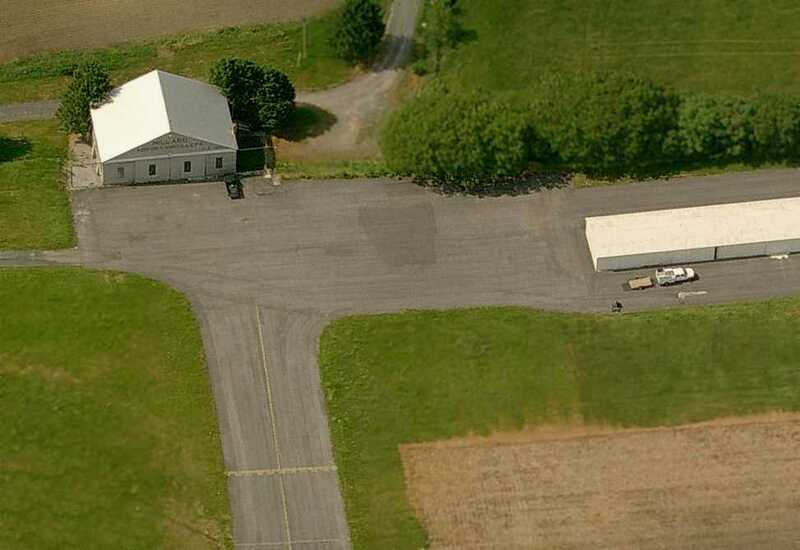 This small general aviation airport was located on the south side of Carlisle Pike. The date of construction of Taylor Field has not been determined. 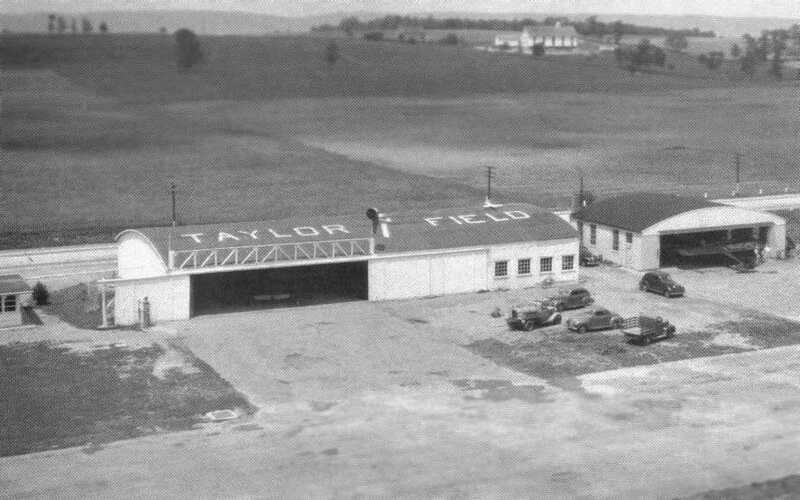 The earliest depiction which has been located of Taylor Field was a 1937 aerial view. It depicted Taylor Field as having 2 grass runways (northeast/southwest & northwest/southeast). along with at least 3 light aircraft. A circa 1930s aerial view looking at 2 hangars & 4 monoplanes & biplanes at Taylor Field (courtesy of Tom Johnstone). 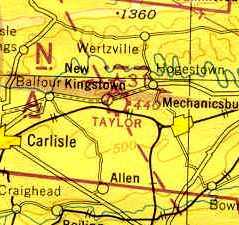 The earliest aeronautical chart depiction which has been located of Taylor Field was on the 1945 NY Sectional Chart. 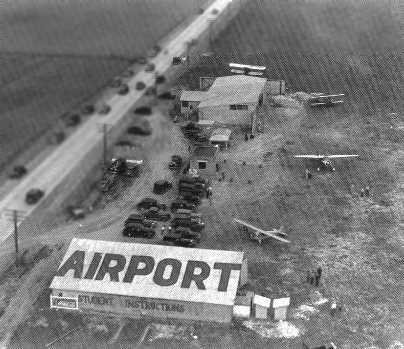 It depicted Taylor as a commercial/municipal airport. as an 90 acre U-shaped property within which were 3 sod runways, with the longest being the 2800' east/west strip. 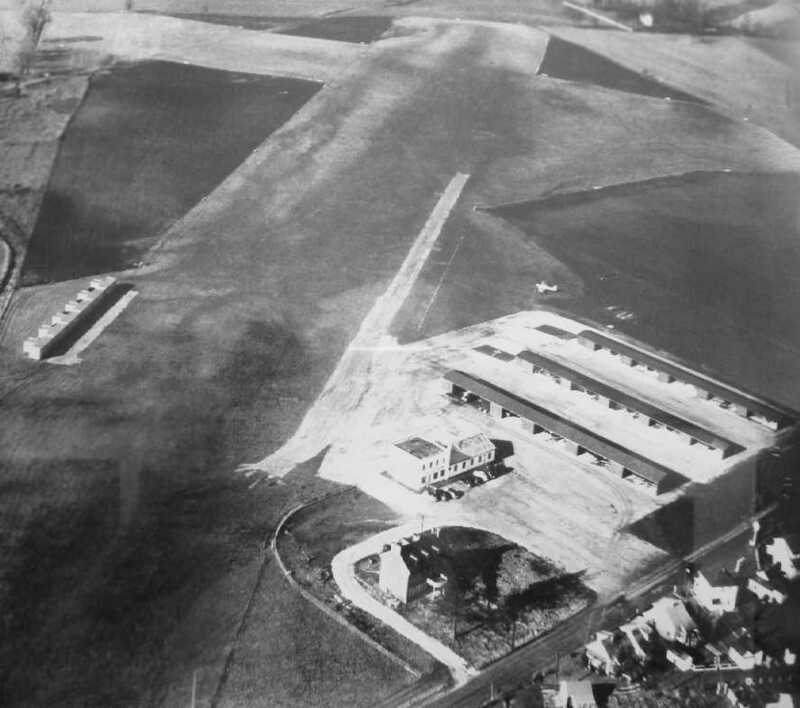 A circa 1950 aerial view looking north at the hangars at Taylor Field (courtesy of Tom Johnstone). A circa 1950 photo of Taylor Field's operations building, with control tower on top (courtesy of Tom Johnstone). along with 6 small buildings along the northwest side of the field. 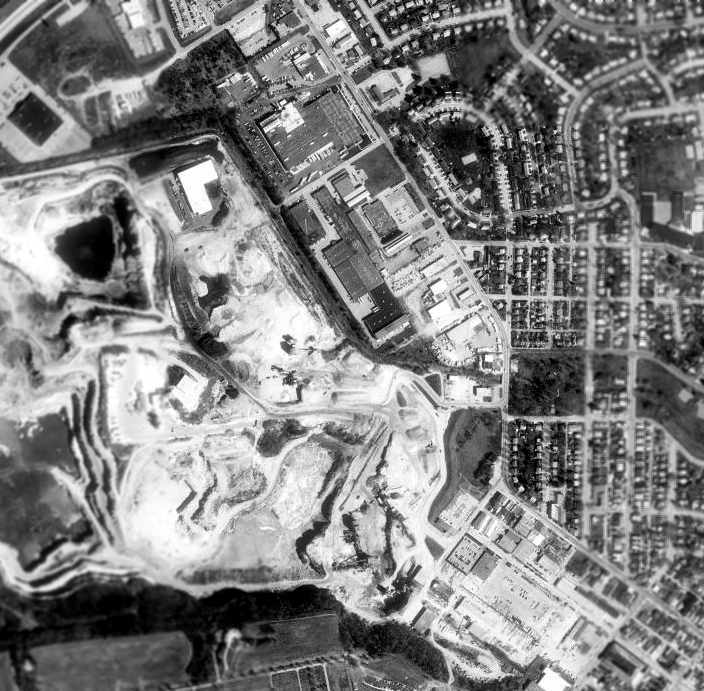 which had been extended to the west compared to the 1937 aerial view. Several buildings were located along the north side, along with a sole single-engine plane. A 1961 aerial view depicted Taylor Field in the same configuration. A total of 4 light planes were visible near the hangars. as that is how it was depicted on the 1967 NY Sectional Chart. The field was depicted as having a 2,600' unpaved runway. 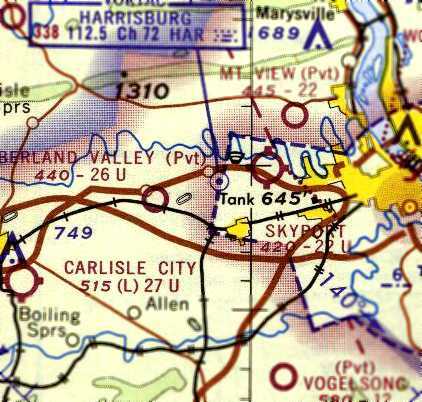 Cumberland Valley Airport was still depicted on the 1969 USGS topo map. as an August 1971 aerial view showed that a large building had been built over the western end of the former east/west runway. The runways remained otherwise intact, as did the hangars & other airport buildings. Tom Johnstone reported, “I moved to South Central Pennsylvania in 1975. 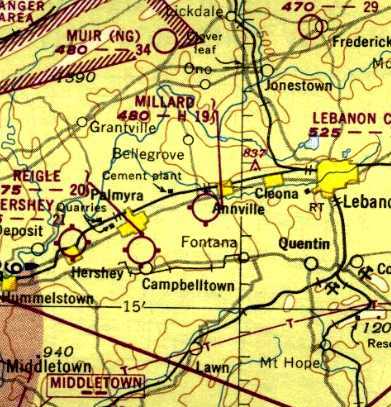 Cumberland Valley Airport was no longer depicted at all on the 1980 USGS topo map. A 1994 USGS aerial view showed that 2 large warehouses had been built over the southern portion of Taylor Field. A circa 2006-2010 aerial view looking south at the former Taylor Field control tower building (the same building depicted in the 1950 photo). minus the control tower cab which was removed at some point between 1950-2008. Tom reported, “The place is a landscape business. As the years went by the area has changed, but I still look for that building which stills stands. but the former airport operations building still remains on the north side of the property. The site of Taylor Field is located south of the intersection of Carlisle Pike & Taylor Boulevard, appropriately enough. with an Aeronca & Cub on the ground, and another Cub overhead. as the Conestoga Valley Airport in New Holland was listed as a new airport in the 3/31/48 Airman's Guide (according to Chris Kennedy). It was described as having 2 unpaved runways, with the longest being 2,000'. as that is how it was labeled on the 1949 NY Sectional Chart (courtesy of Mike Keefe). It depicted New Holland as having a 2,000' unpaved runway. 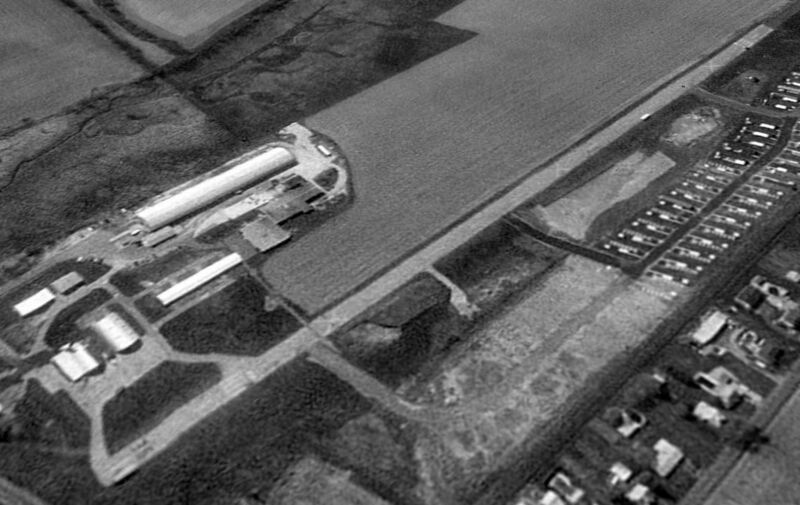 The earliest dated photo which has been located of New Holland Airport was a 1951 aerial view. with some small buildings on the south side of the field, and 2 light aircraft parked outside. with large numbers of spectators in attendance for some type of event. 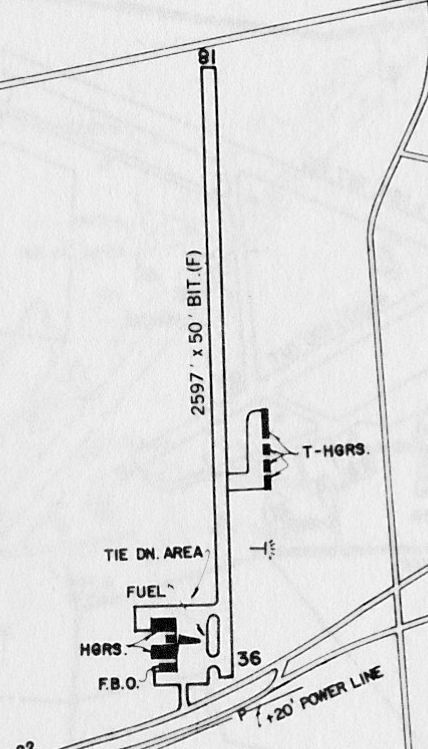 The 1956 USGS topo map depicted New Holland as having 2 turf runways, with a few small buildings along the south side. 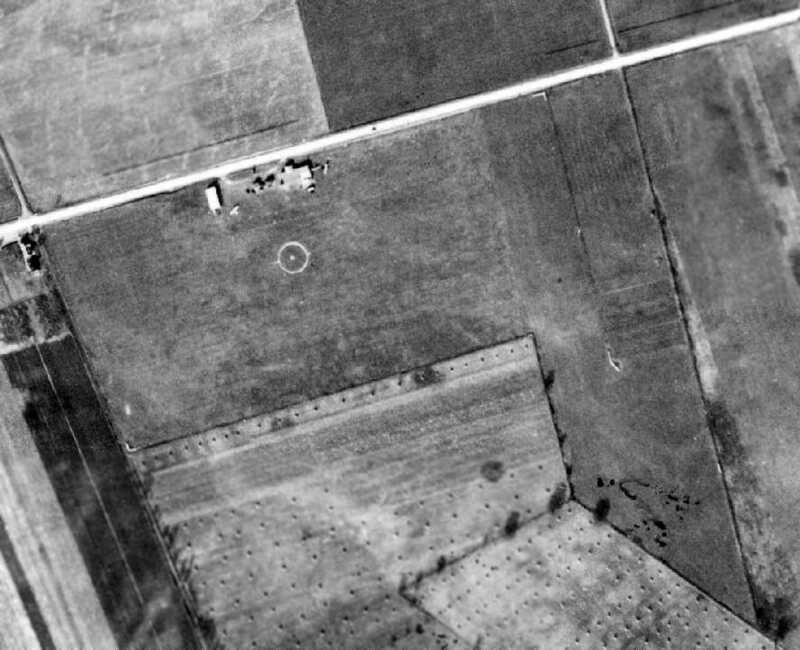 A 10/3/57 aerial view (from Penn Pilot) depicted New Holland Airport as having 2 grass runways, with some small buildings on the south side of the field. 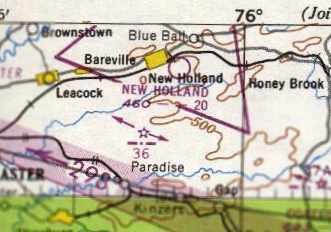 The 1957, 1958, and 1960 NY Sectional Charts (courtesy of Mike Keefe) depicted New Holland Airport as having a 2,100' unpaved runway. 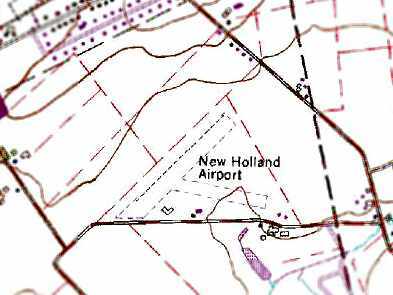 The 1963 AOPA Airport Directory (according to Chris Kennedy) described New Holland as having 2 turf runways. 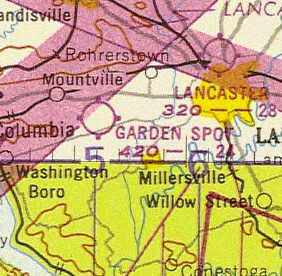 as the 1964 Washington Sectional Chart depicted New Holland as having a single 2,200' paved northeast/southwest runway. 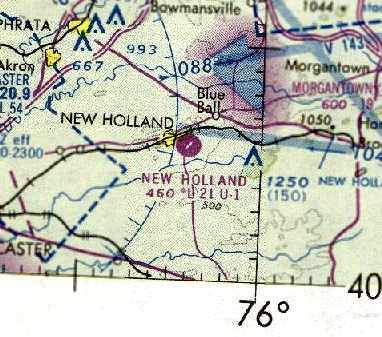 The 1965 & 1967 NY Sectional Charts (courtesy of Mike Keefe) depicted New Holland Airport as having a 2,100' paved runway. from a sponsor's advertisement from Tim Kaufman's 1968 high school yearbook. with a 2,186' paved Runway 5/23 evidently which had been added along the northwest side of the existing turf Runway 5/23. Two small buildings (hangars?) were depicted on the south side of the field. A 7/4/71 aerial view of the New Holland Airport depicted the field as having a single paved runway & a crosswind grass runway. A dozen light aircraft were visible parked on the southwest side of the field. A Flight Simulator scenery re-creation by Richard Finley of a Meyers 200 overflying New Holland Airport. Tim Kauffman recalled, “New Holland Airport... My father gave ground instruction there & I learned to fly there in the very early 1970s. I knew the owners, Alfred & Gladys Stover. and was painted with large red & yellow squares for visibility. the long leg having a narrow paved surface & parallel grass landing area & the short side grass only. It was your typically ideal small airport. The owner was also a Cessna dealer. I spent many, many enjoyable hours there as a boy & young man. There was also a Link trainer in the office/classroom building. was on the 1975 NY Sectional Chart (courtesy of Mike Keefe). It depicted New Holland Airport as having a single 2,100' paved runway. 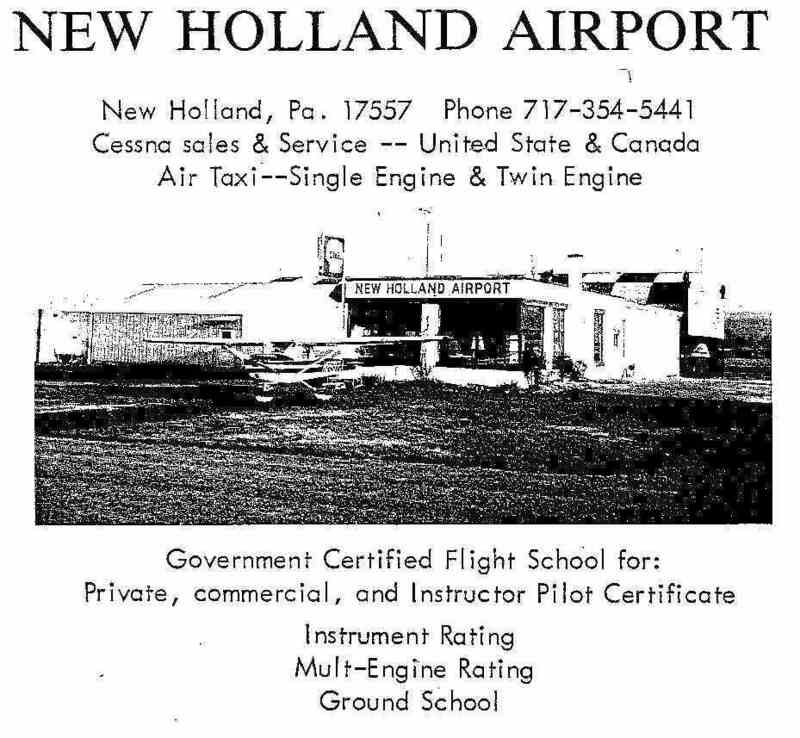 Dan Morris recalled, “New Holland Airport- I flew in & out of this airport up until its closing. My last log entry shows that sometime in spring of 1975. My last flight there was actually after it was removed from the sectional. I did a landing in 1'-high grass & then departed. My last flight there was with the runway blocked with construction equipment & that was why I was landing on the grass. The rumors of its closing existed for a year or 2 before it actually did. sometime around Hurricane Agnes in the 1970s. 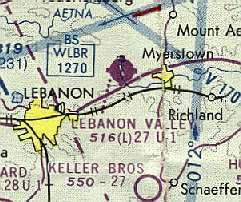 as it was no longer depicted among active airfields in the 1976 AOPA Airport Directory (according to Chris Kennedy). 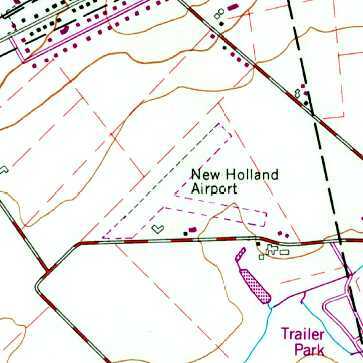 Strangely, the 1994 USGS topo map continued to depict the New Holland Airport, 18 years after it had been closed. but instead only depicted the airport as having 2 unpaved runways. It also depicted several small buildings (hangars?) on the south side of the field. 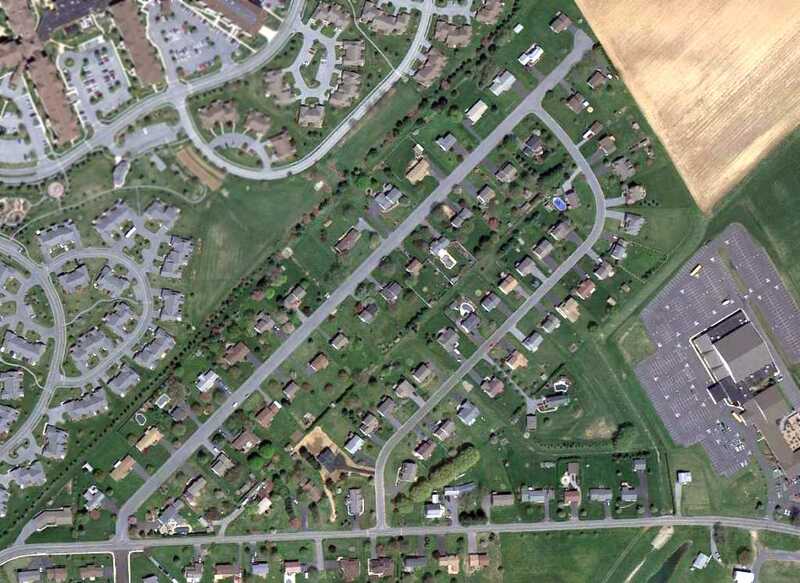 A 1999 USGS aerial photo showed that the site of New Holland Airport had been covered by a housing development. It has not been determined if any of the former airport buildings remain intact. 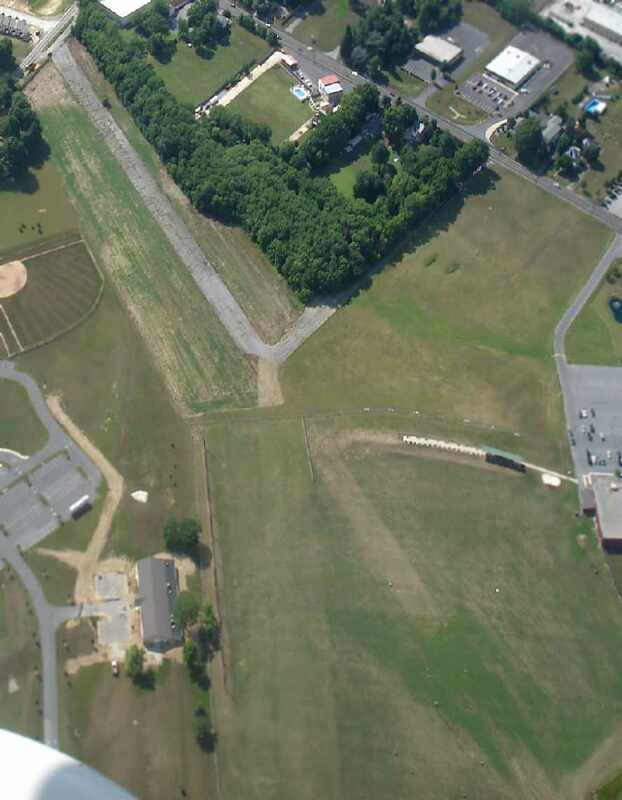 A 4/24/13 aerial view showed the site of New Holland Airport to be covered by a housing development. with the former east/west runway covered by Windsock Way. The street which runs along the southern edge of the property is Airport Road. 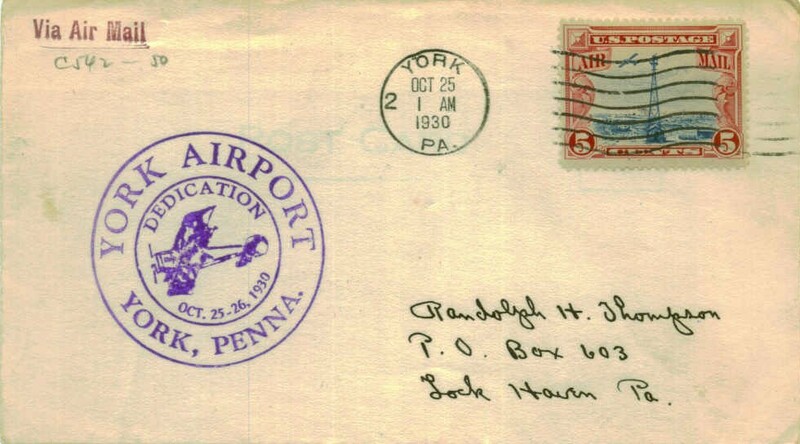 A postmark commemorated the 10/25/30 Dedication of York Airport. 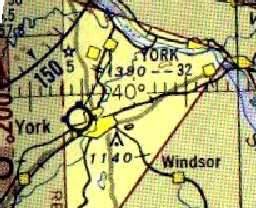 The original York Airport was located on the northwest side of the town. 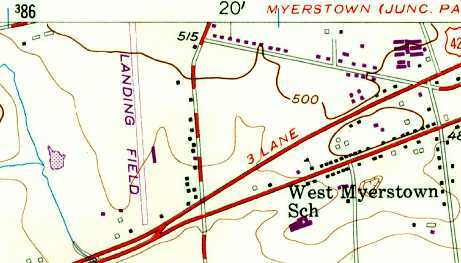 No airfield was depicted at this location on the 1946 Washington Sectional Chart (courtesy of Mike Keefe). 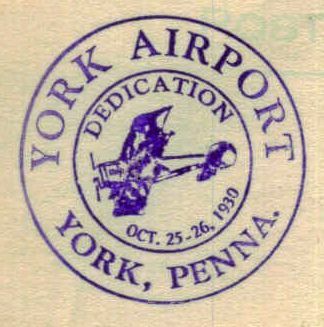 According to a historical display in the current York Airport, the original York Airport was operated by Oscar Hostetter. 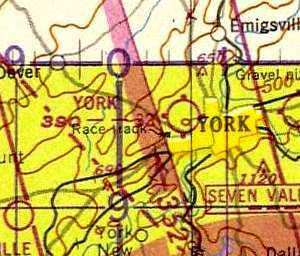 The earliest depiction which has been located of the York Airport was on the 1946 USGS topo map. showing 2 grass runways & 4 rows of T-hangars. It described York Airport as having a 3,200' unpaved runway. According to Gene Garnes, "I believe that there used to be a small general aviation airport in West York. It had one turf runway, located along Roosevelt Avenue near Wood Street." Richard Niess recalled of the airport in West York, “It had one turf 3,200' runway. It was located along Roosevelt Avenue near Wood Street. Dr. Wayne Shaullis & I were student pilots & together we purchased a tandem Taylorcraft (no electrical system & we spun the prop to start it). It was hangared there, owned by a young man who was called back into the Marine Corps to go to Korea, and he sold it to us for $500. We both flew it a lot & in 2 years sold it for $800. We both learned to fly & soloed at the old field, owned by Oscar Hostetter. with the longest being 3,040'. and one single-engine plane parked near 4 rows of T-hangars. The original York Airport was depicted on the 1953 Flight Chart (courtesy of Scott O'Donnell) as having a 3,200' unpaved runway. which depicted an irregularly-shaped outline, labeled “Airport”, with 6 buildings along the east side. a few miles to the southwest. the T-hangars from the original York Airport were relocated to the new York Airport when the original airport was closed. and there was no obvious trace remaining of the former airport. (which presumably was the location of the runways) is now a rock quarry. However, Gene Garnes reported in 2003 that some remnants of the original York Airport still exist. you can still see some of the hangars that were part of the airport & are now being used for other purposes." 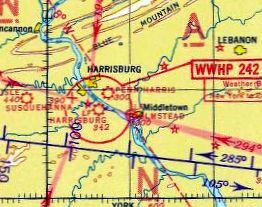 Hershey Airpark, as depicted on the 1950 NY Sectional Chart (courtesy of Mike Keefe). as part of their hotel & entertainment complex. 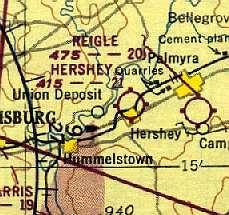 However, no airport in Hershey was listed among active airfields in the 1945 AAF Airfield Directory (courtesy of Scott Murdock). was on the 1949 NY Sectional Chart (according to Chris Kennedy). It depicted Hershey as having a 2,600' unpaved runway. Eleanor Williamson recalled, “I am the widow of Harry Williamson who bought his interest in the airport in the early 1950s. He operated the airport for 20 years. Under his leadership, it became a very thriving little airport. He had all the ratings, of which he was very proud. He also had many more hangars built & also the main hangar where airplanes were serviced. He was a Piper dealer, making salesman of the year. He taught flying, ground school. In essence, he did it all. Many of his customers (friends) were professional people, who not only learned to fly from him, but bought planes from him. At one time he had a helicopter there - another time a bi-plane. On weekends he had a very good business hopping passengers over the rose gardens etc. 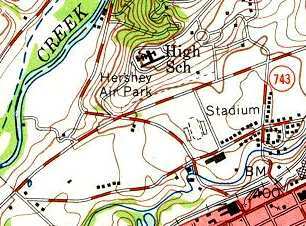 The 1956 USGS topo map depicted “Hershey Air Park” as having a single unpaved east/west runway. as having a single 2,600' turf east/west runway. The operator was listed as Harry Williamson. A circa 1950s photo by Mike Wotovitch of Hershey Airpark, showing a Piper Cub, 2 Ercoupes, and 2 Navions in front of the hangars. A circa 1950s photo by Mike Wotovitch of a Tom Hill's Luscombe 2599K in front of a hangar at Hershey Airpark. Mike recalled of this plane, “I often flew it on cross-country because it had a cruise propeller (ground-hugger on takeoff). with a cluster of buildings on the northeast side. 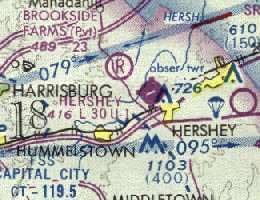 as having a single turf runway, and the operator was listed as Hershey Flying Service. 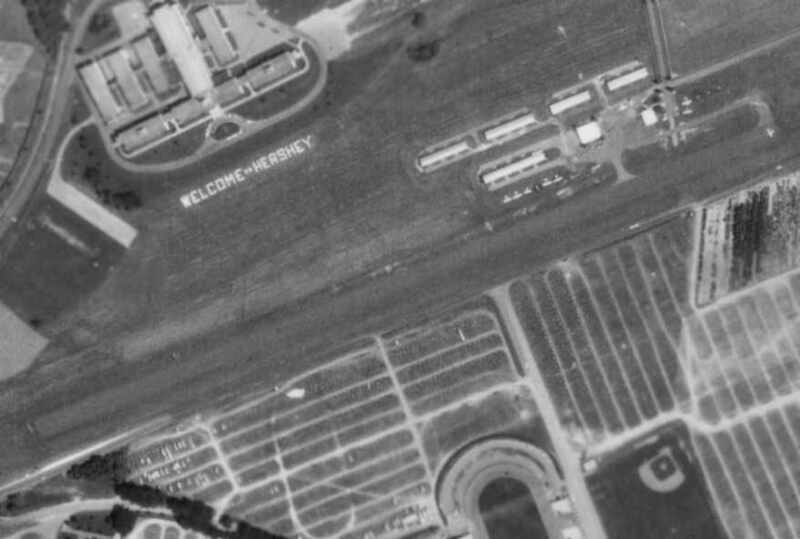 Hershey Airpark was expanded to its eventual size (a single 3,000' paved runway) in 1963.
depicted Hershey Airpark as having a total of 6 hangars along the east end of the runway. Tim Black recalled, “I started as a lineboy at the Hershey Airport in the Spring of 1965 & worked there until about June of 1968. I recieved my pilots licence from Hershey. My check ride was done by my boss Harry Williamson. At that time we had 5 instructors: Dale Lenhert, Larry Kline, Alan Hiney, Kay Tallman, and Allan Zalenga. The secretary to Harry Williamson was Beverly Cernugle. I had just received my commercial when I had left. We had 2 full-time mechanics who taught me the basics on mechanics especially in the winter when things were slow. When Harry had the airport we did a good business especially in the summers. I towed the banner for airplane rides, which then were $2. Gregory Miely recalled, “When I was 15 years old in 1969, new neighbors moved in next door. It was Harry Williamson & his wife & 2 children. After about 2 weeks when their grass had not been cut, I decided to cut their lawn at the same time that I cut ours. Harry came over that night to thank me & offered me a job at the airport to work as a lineboy, fueling the aircraft, and doing general grounds maintenance. I worked there from 1969-74. I earned my Private Pilot's License in 1970 & Harry was the FAA flight examiner. and who were my instructors, were Lamont Zimmerman II & Dave Stouffer. One of the other instructors during the 1970s, who started as a lineboy, was Ken Sager. Gregory continued, “The airport was a Piper dealership & Piper aircraft were used in the flight school. 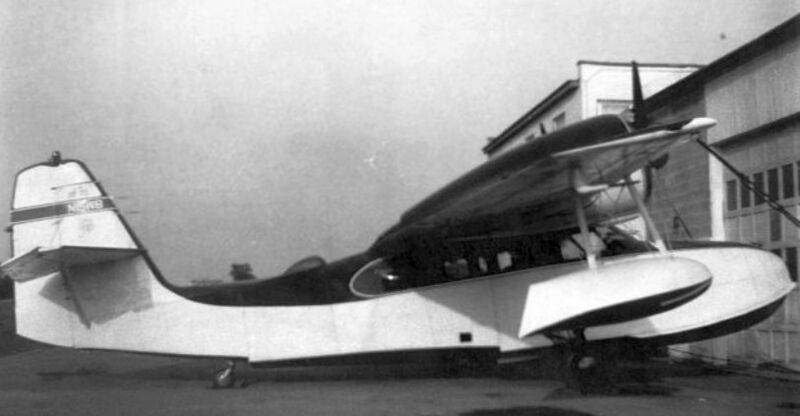 The airport also owned a Champion Citabra, the original having a 115 HP engine & the replacement having a 150 HP engine. The plane was used for banner towing & instruction, including aerobatic instruction. The glider that most frequently launched from Hershey belonged to Quentin Berg, who owned Berg Electronics, Inc. The airport also owned a 1942 Stearman, an open-cockpit biplane, that had a inertia starter. Essentially, it was a gearbox that sat behind the engine & in front of the front cockpit. then remove the crank & pull a small handle next to the port. the airport offered airplane rides & did a thriving business during the summer when the amusement park was open. There were several close calls when people from the amusement park would walk across the runway just as an airplane was landing or taking off. and the airport saw some of its busiest days during that meet, with hundreds of airplanes, including many antique airplanes, arriving every day. We parked airplanes on every square inch of usable grass at the airport. showing a Piper landing at Hershey Airpark, with several other planes & hangars in the background. which was owned by one of the Airframe & Powerplant mechanics, Al Griffith. which of course with the help of Hershey Estates, he did. Bob Mumma was a local politician who knew a good thing when he saw it. He persuaded Hershey Estates to let him have the airport. I imagine some scheming was done. Anyway, Harry lost his lease. With no experience in the airport business, even naming the airport Derry Aire, I think he lasted about 2 years. with 5 hangars, and 7 aircraft visible on the field, including one at the eastern end of the runway. as that is where I earned my private pilot's license in 1971. I personally knew Harry Williamson, who managed the airport." drawn by the signs towed over town that said 'AIRPLANE RIDES'. The cost was $5 / person. They flew Pipers at that time, meaning that you really couldn't see much since the wings got in the way. There were a couple of pilots who provided rides. I can't imagine they made a good living out of that job, but there was always a pilot on site. The one I remember most was named Zimmerman. Matthew continued, “Also on the airport property was a Stearman trainer, painted a pretty standard blue & yellow. Rides in it were $10 & I can still kick myself for never springing for one. The pilot got into trouble more than once by doing aerobatics over town. Matthew continued, “Another unique plane on the property was a Citabria. which from what I recall was only ever used to tow the sign advertising airplane rides. A few times I was able to watch a glider fly out of & into the airport. but was dismayed when the owner died soon after that flight. Once a military helicopter landed there. It was a tiny thing, an open framework of tubes with a seat on them, and no taller than a person. I don't recall the reason for the landing though. It might have been mechanical problems. Mitch Funk recalled his 1st solo flight, at Hershey Airport “in 1972. I remember a late afternoon takeoff near sundown on a crisp & beautiful autumn day. with the chocolate factory looming like something from a Willy Wonka movie can still make me smile. Hershey Airpark, as depicted on a 1975 approach plate (courtesy of Timothy Aanerud). Hershey Airpark, as depicted on the 1975 NY Sectional Chart (courtesy of Mike Keefe). John Baker recalled, “It was a great location, right across the street from the popular Hershey Amusement Park. Around 1979, my wife & I flew there with friends for the annual July 4th fireworks display at Hershey Park. After the show ended near midnight, we crossed the street to the airport & took off. Automobile traffic leaving the amusement park after the fireworks created quite a backup on the highway leaving the area. Hershey Airpark was closed by the Hershey Company in 1981. Robert Tonkin recalled, "I was told that the airport was closed because it was not earning enough money. At least, that is what the local rumors were at the time. 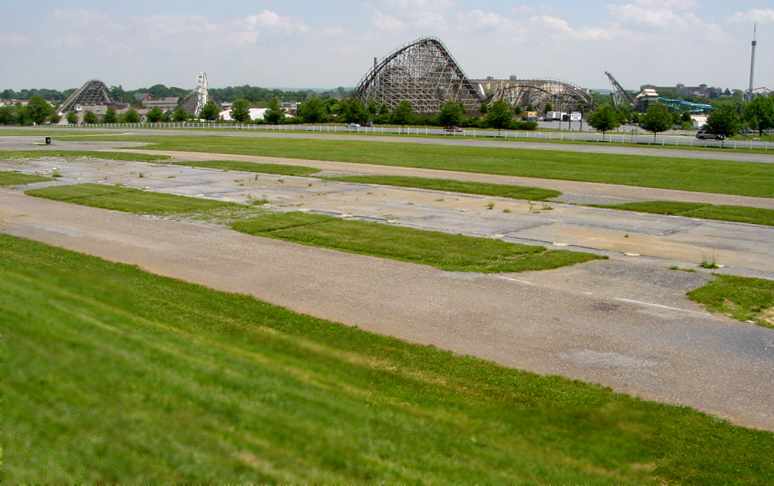 Regardless, Hershey Airpark is sadly missed." and, having worked for Hershey Estates for years I don't doubt it at all. including the airport, the local electric, telephone, and water companies, and anything else that didn't make economic sense. and they began to spread out, to the Poconos, Philadelphia, and Texas. but the need for capital made the executives rethink anything they currently had that wasn't profitable, or about to be. Aerial view looking southwest at Hershey Airpark by Paul Freeman, 2001, taken from a Diamond Katana DA20-C1. 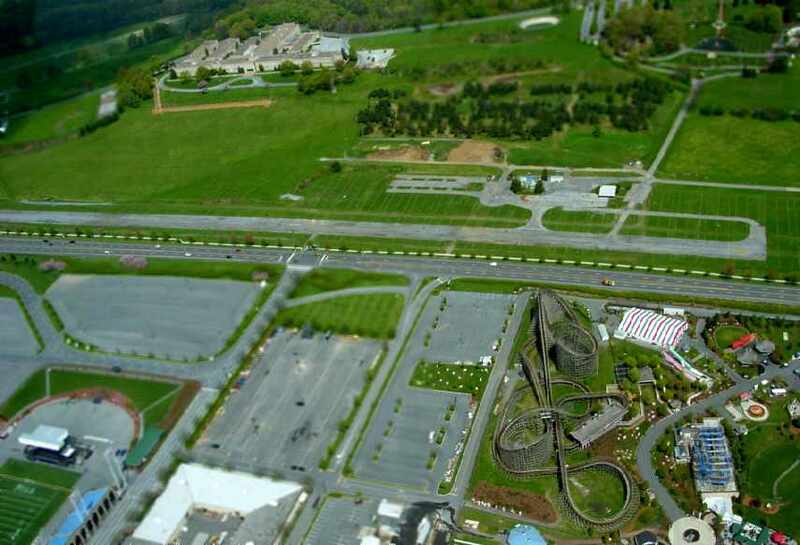 Note the roller-coasters of HersheyPark to the left of the runway. A 2005 aerial view by Paul Freeman of the remains of the Hershey Airpark ramp. It appears as if at least one former airport building (the white building on the right) remains standing. 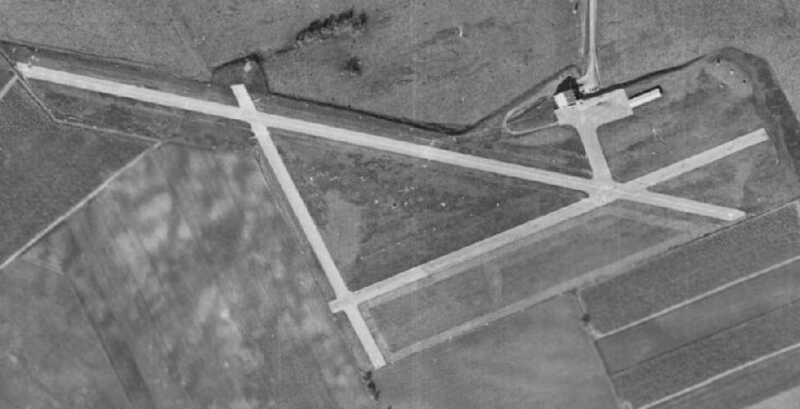 although with "X" closed airfield markings painted along the runway. 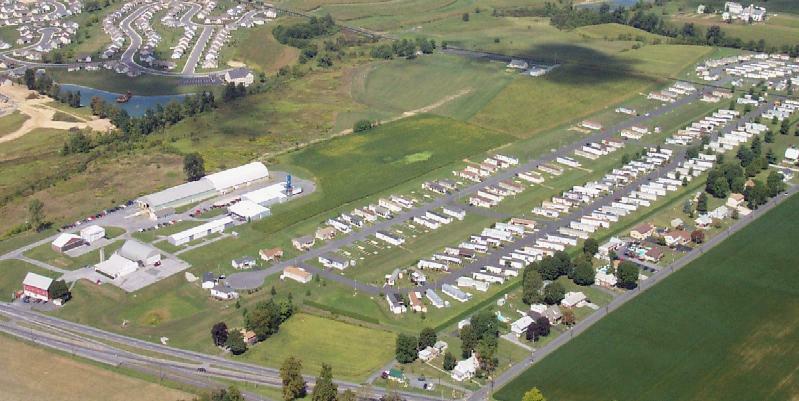 A 2005 aerial view by Scott Schuyler looking northwest at Hershey Airpark. and during the rest of the year the nearby PA State Police training school uses it. A 2005 photo by Scott Schuyler of the former terminal building at Hershey Airpark. 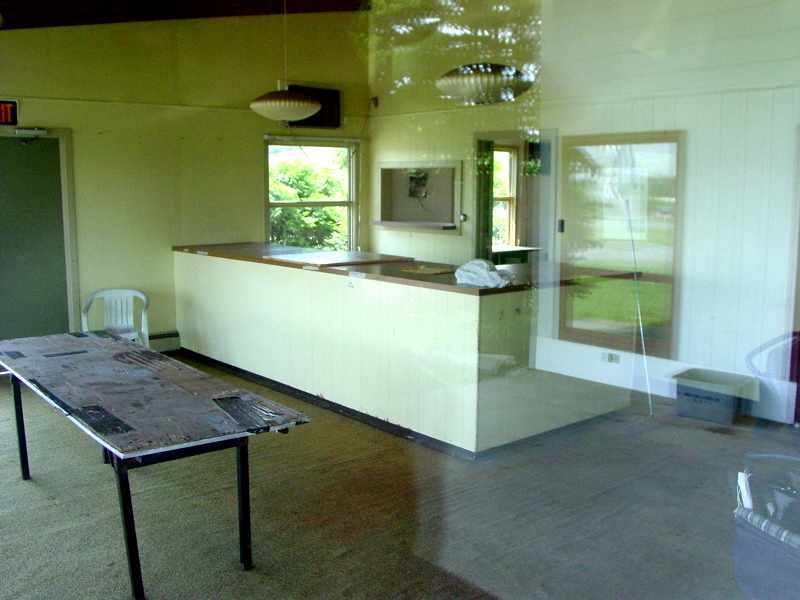 A 2005 photo by Scott Schuyler of the interior of the former terminal building at Hershey Airpark. A 2005 photo by Scott Schuyler of the former parking ramp, with the roller-coasters of HersheyPark in the background. located on the hill behind the former airport. showing the terminal building, and the “X” closed runway symbol still visible on the east end of the runway. Matthew Loser reported in 2007, “The windsock base has been removed. as it is used frequently for what Hersheypark calls overflow parking, mostly for concerts & sometimes for very busy days at Hersheypark. It is also used for special events, the most notable of which is the annual antique auto event, when it is open to vendors & campers. The other use for the old airport is as a shuttle bus parking area. and these buses are parked by the old airport administration building when not in use. A 5/12/17 photo looking northeast along the remains of the Hershey Airpark runway, with a HersheyPark roller-coaster visible across the street. 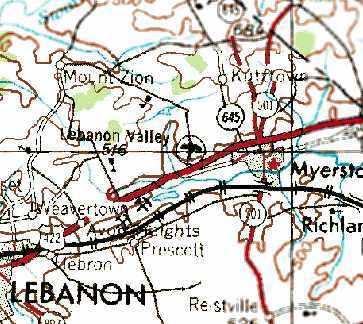 Lebanon Valley, as depicted on the 1969 USGS 62k topo map. The date of establishment of this little general aviation airport has not been determined. “I walked from home in Myerstown to the Airport right after WWII (1945/1946?). 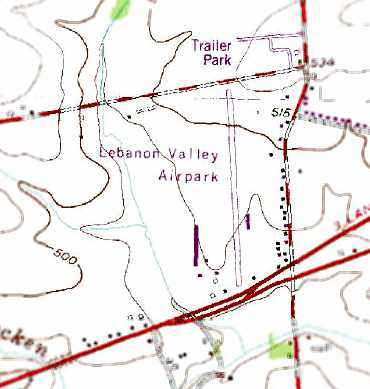 The earliest depiction of Lebanon Valley Airpark which has been located was a 1951 aerial photo. It depicted the field as having a single grass north/south runway, with a row of T-hangars on the east side. nor on the 1967 NY Sectional Chart (courtesy of Mike Keefe). was on the 1969 NY Sectional Chart (according to Chris Kennedy). It described the field as having 2 runways, with the longest being a 2,610' asphalt strip. The other strip was apparently grass, as the remarks said "Turf strip closed in winter." with a few small buildings around the southwest & southeast. with at least 3 light aircraft parked near the buildings at the southeast corner of the field. 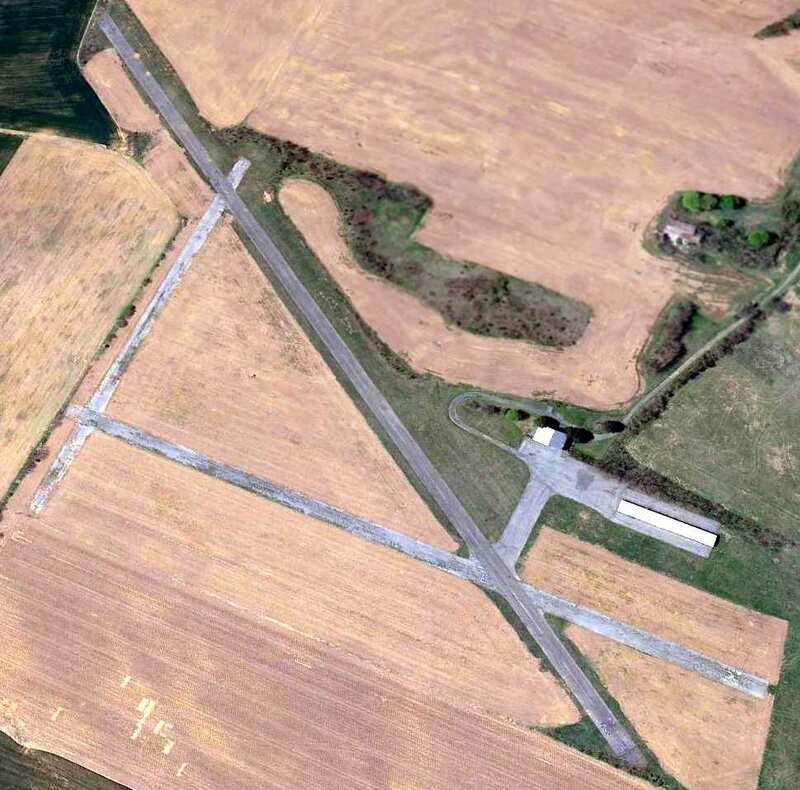 described Lebanon Valley Airpark as having a 2,800' paved Runway 18/36. depicted Lebanon Valley as having a single 2,700' paved runway. on the 1980 NY Sectional Aeronautical Chart (courtesy of Ed Drury). with a small ramp area & 4 T-hangars on the east side, and another ramp with 2 hangars & an FBO on the southeast side. on the December 1991 NY Sectional Chart (according to Timothy Aanerud). It may have been replaced by Deck Airport (1 mile to the south). even though the airport had evidently already been closed for at least a year by that point. although with closed-runway “X” symbols visible on both ends of the runway. with trailer homes lining both sides of the former runway. taken 2001 from a Diamond Katana DA20-C1. The former runway were still quite recognizable from the air as a former airport. The former hangars still stood, southwest of the former runway. 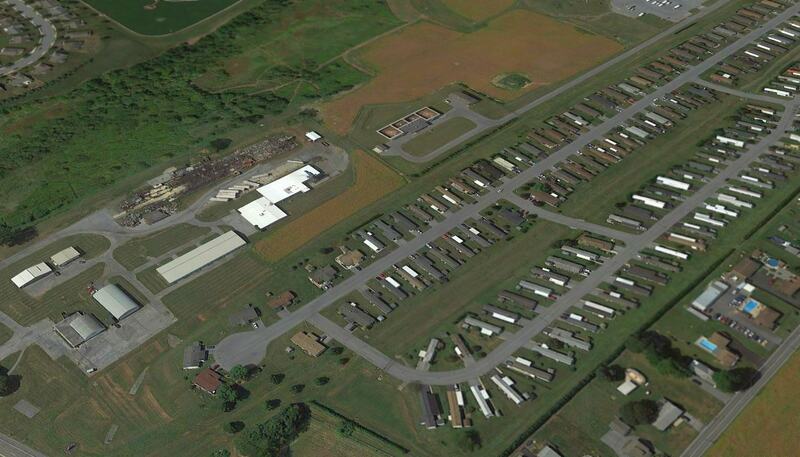 A circa 2006 aerial view looking west at the former hangars & runway of Lebanon Valley Airpark. and the hangars remaining at bottom-left. 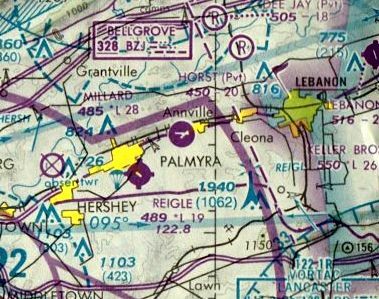 The site of Lebanon Valley Airpark is located northwest of the intersection of Route 422 & North Ramona Road. 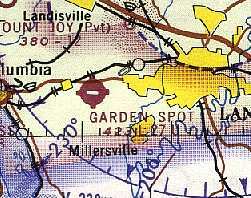 Garden Spot, as depicted on the 1947 Washington Sectional Chart. Shortly after the end of WW2, Roy Geltz bought the Brunswick Farms & established the Garden Spot Air Park. It was a popular airfield for pilots of light aircraft, and a customary stop on "breakfast flights". The exact date of opening of Garden Spot Air Park has not been determined. as it was not depicted on the 1946 Washington Sectional Chart (courtesy of Mike Keefe). which described Garden Spot as having a 2,400' unpaved runway. 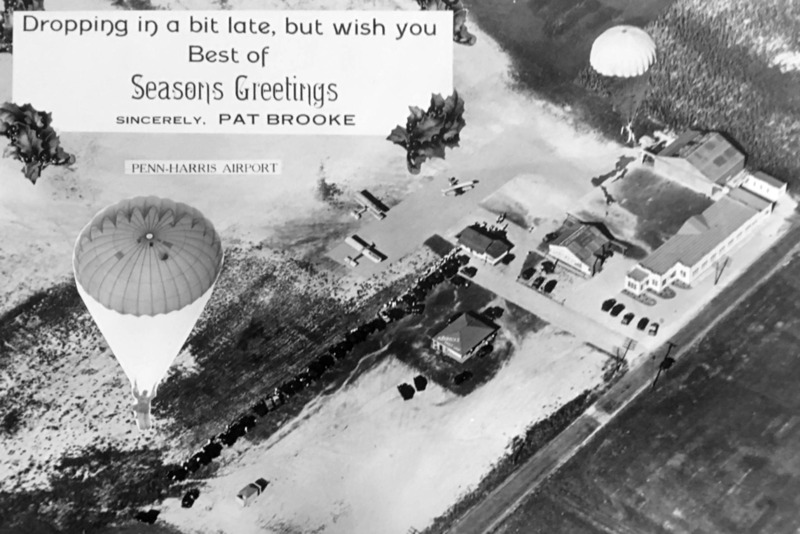 The earliest photo which has been located of Garden Spot Airpark was a 1951 aerial view. 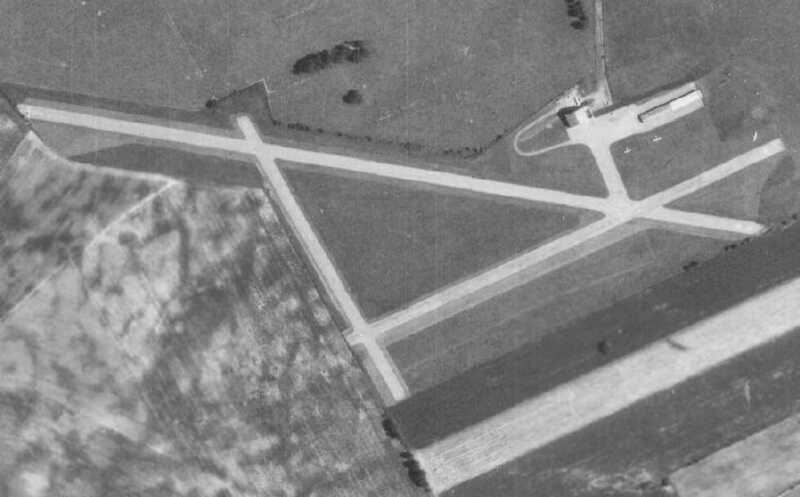 It depicted the field as having a single grass east/west runway, with 4 T-hangars on the north side. The 1955 Washington Sectional Chart (courtesy of Mike Keefe) described Garden Spot in the same manner. After Roy Geltz died in 1954, the fixed based operator became Henry Weber. 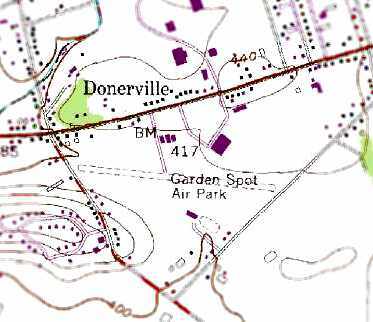 The 1956 USGS topo map depicted the Garden Spot Air Park as having a single unpaved northeast/southwest runway, with a row of small buildings along the north side. 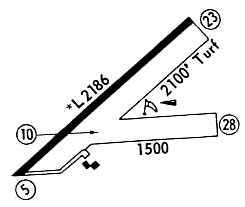 as having 2 turf runways: a 2,500' southeast/northwest strip & a 2,415' east/west strip. The owner was listed as Harry Webber, and the manager was listed as D. Long. with a paved taxiway leading to a number of small hangars on the northwest side. The 1960 Jeppesen Airway Manual (courtesy of Chris Kennedy) depicted Garden Spot as having a single 2,900' paved Runway 10/28. A parallel taxiway on the north side of the runway led to a ramp on the northwest side of the field, with a cluster of several hangars. which depicted 2 single-engine aircraft near the hangars. The 1962 AOPA Airport Directory described Garden Spot as having a single 2,800' paved runway. Henry Weber moved his operation to Lancaster Airport in 1963.
was on the 1967 NY Sectional Chart (courtesy of Mike Keefe). It described Garden Spot as having a 2,700' paved runway. as there were no aircraft visible on the field. Several hangars were north of the runway. as no airfield at the site was depicted on the 1975 NY Sectional Chart (courtesy of Mike Keefe). 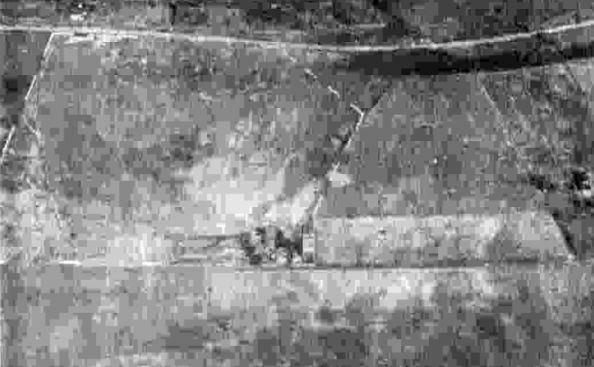 The remains of the runway were still barely visible in the above 1995 USGS aerial picture. 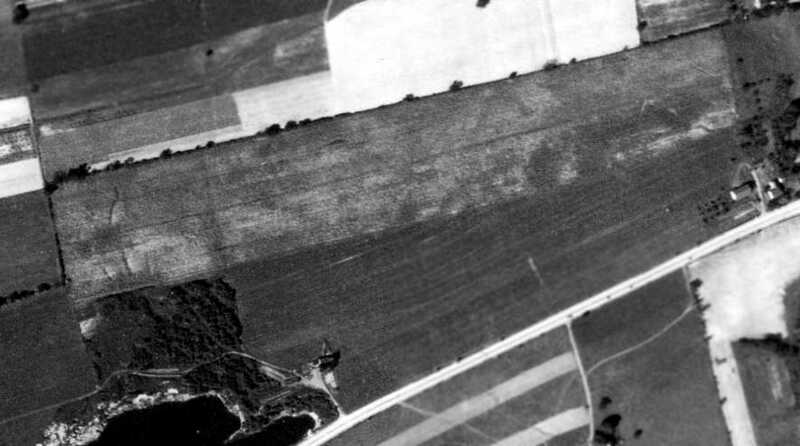 even though the USGS aerial photo from the preceding year showed that the runway had already been removed by that point. 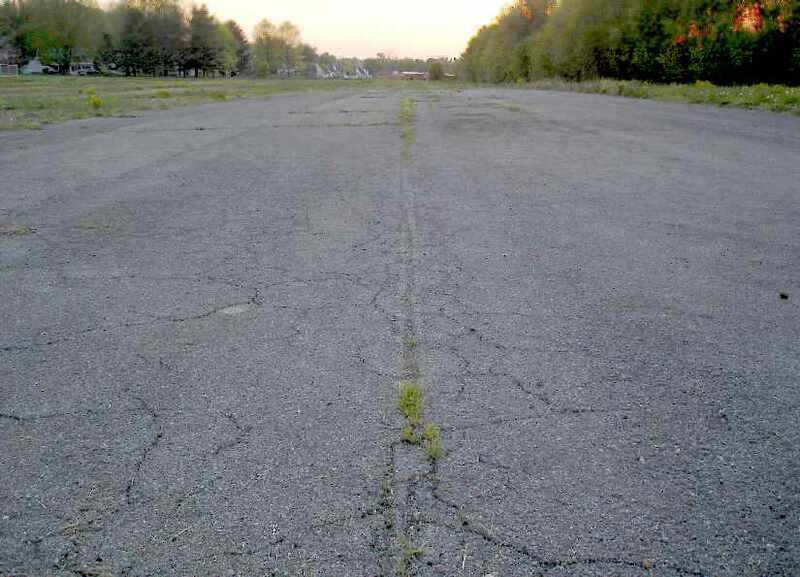 A 2007 photo by Jonathan Furukawa of the remains of the runway pavement at the site of Garden Spot Airpark. Jonathan remarked, “The runway is clearly visible however nothing else remains. A 2007 aerial photo by Jonathan Furukawa looking west at the site of Garden Spot Airpark.